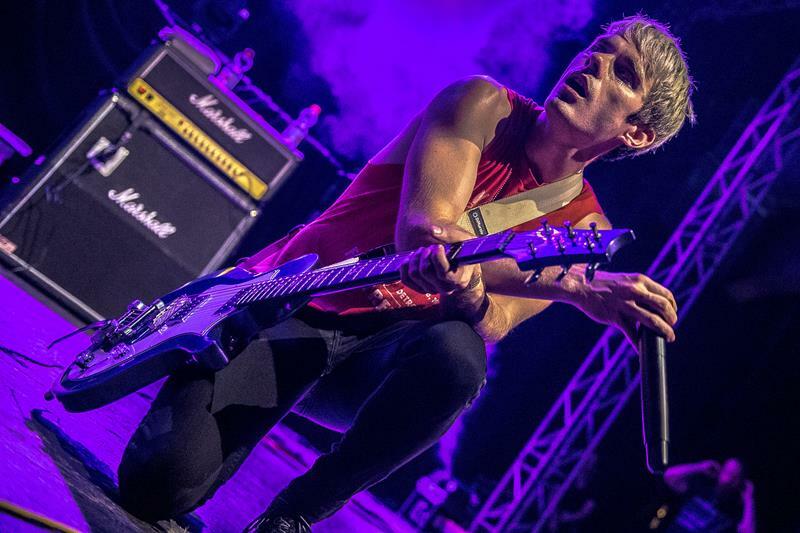 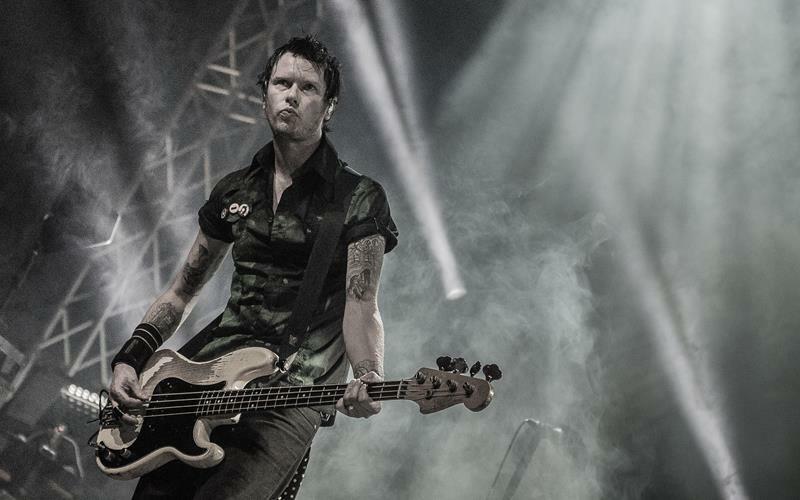 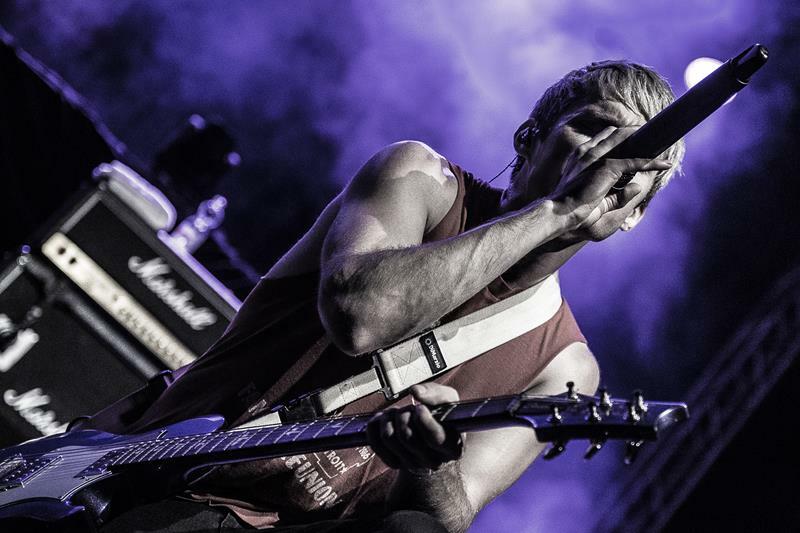 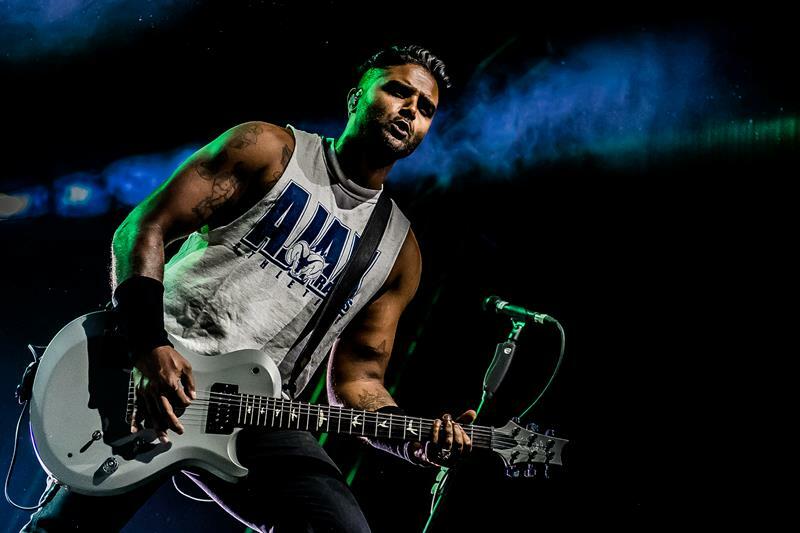 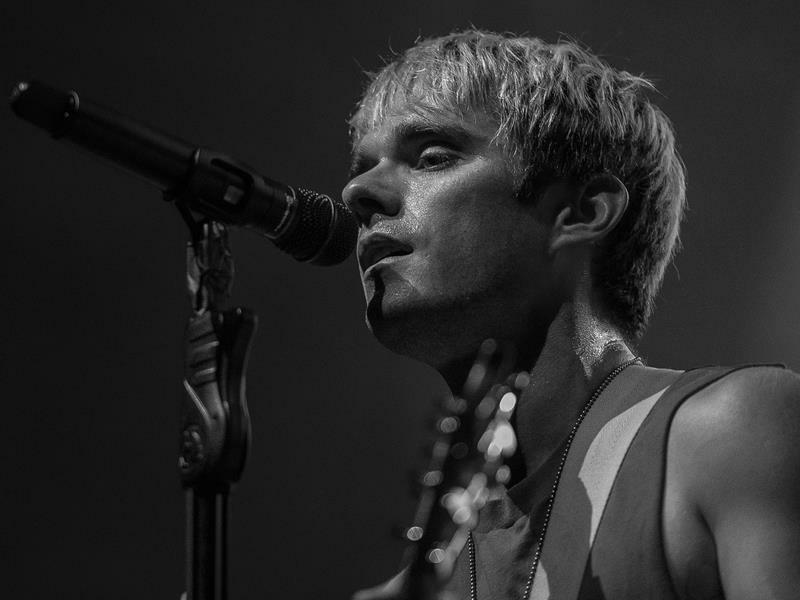 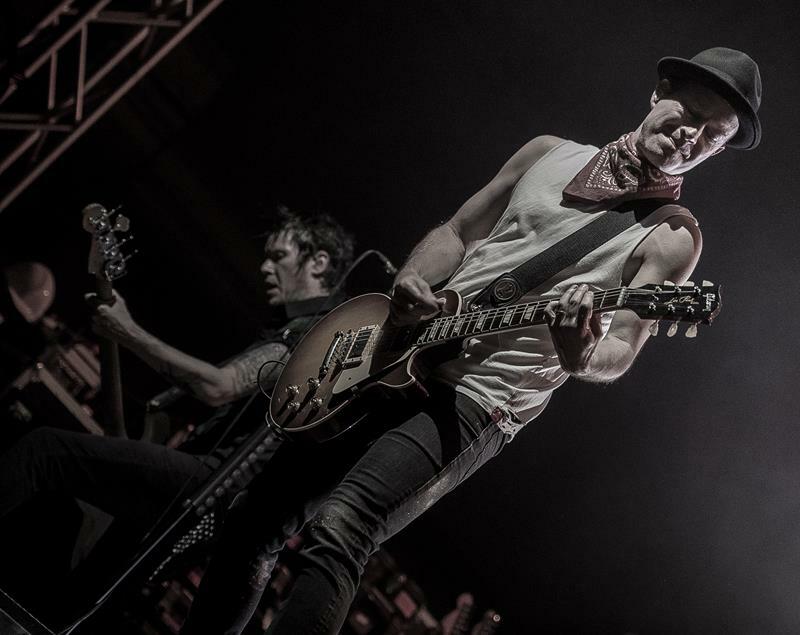 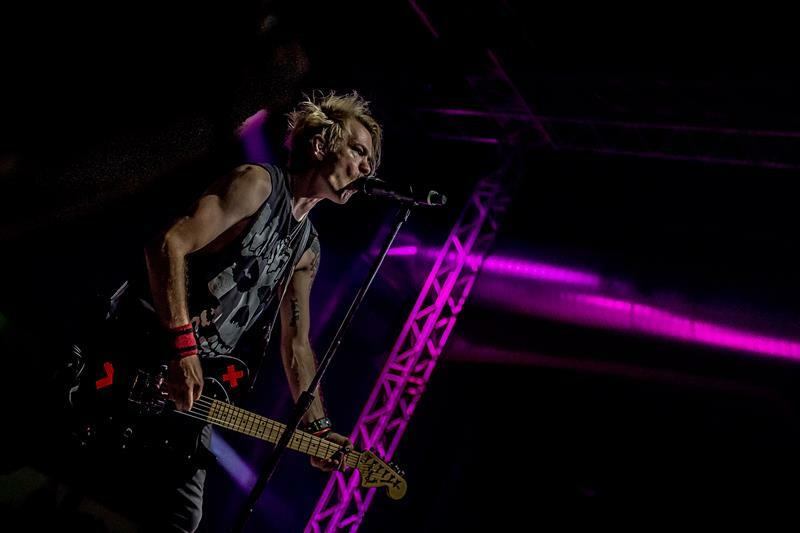 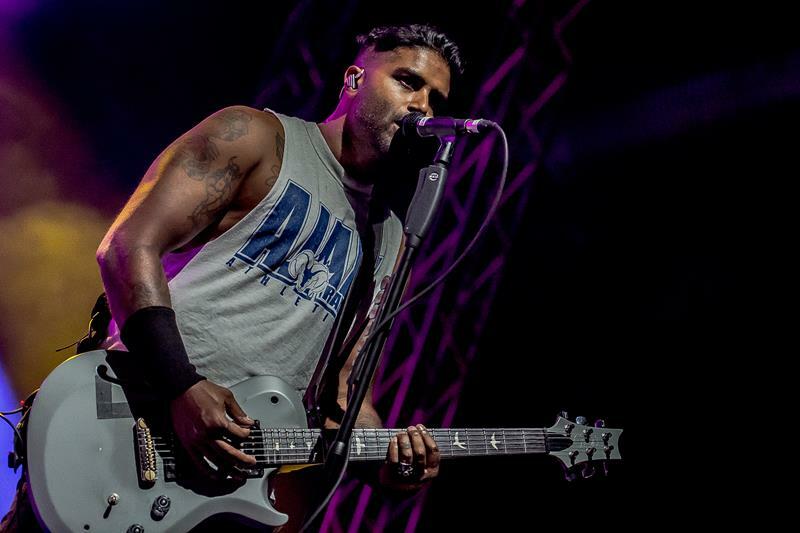 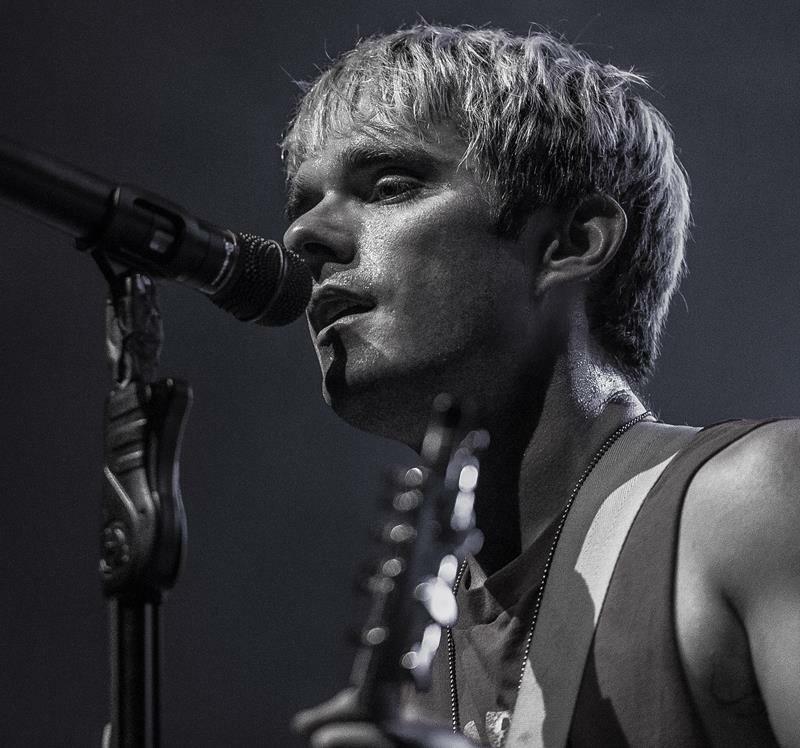 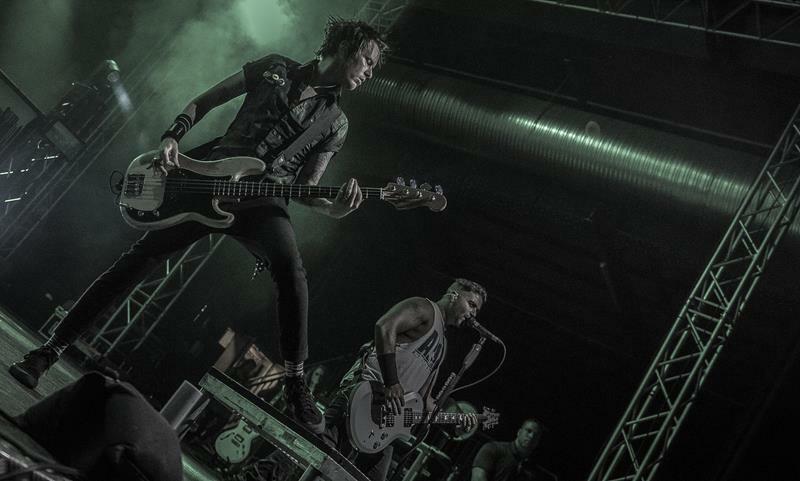 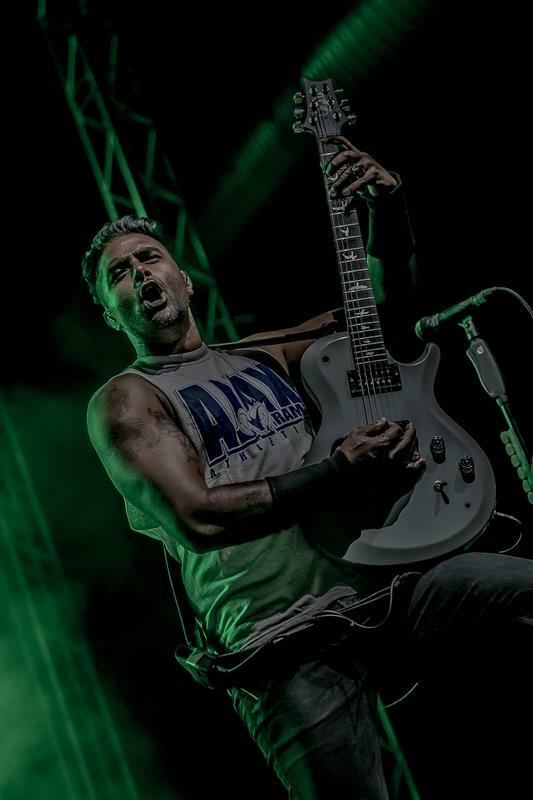 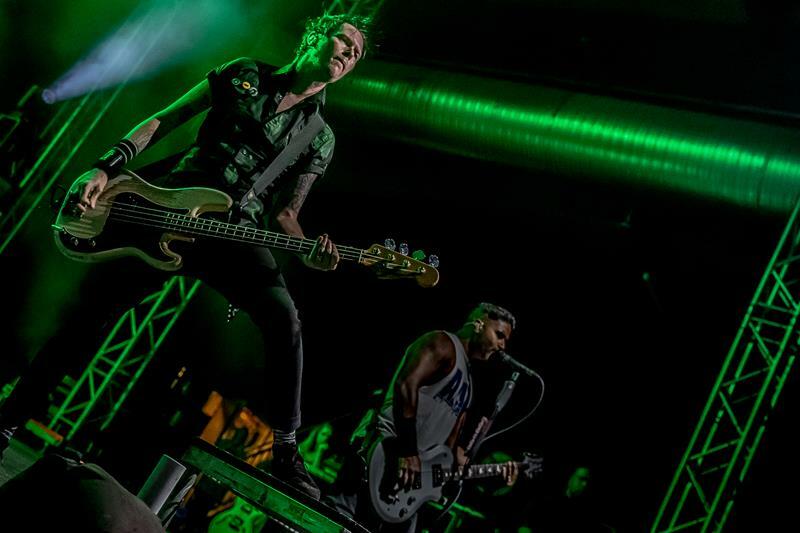 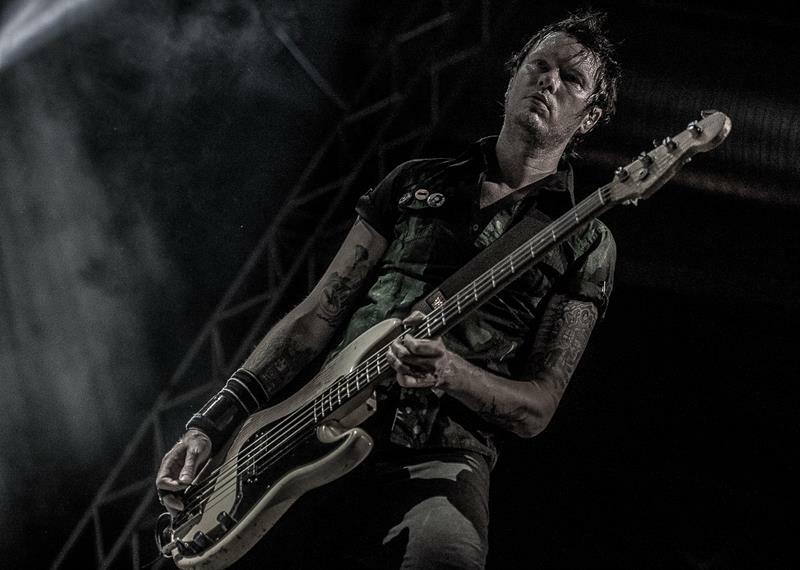 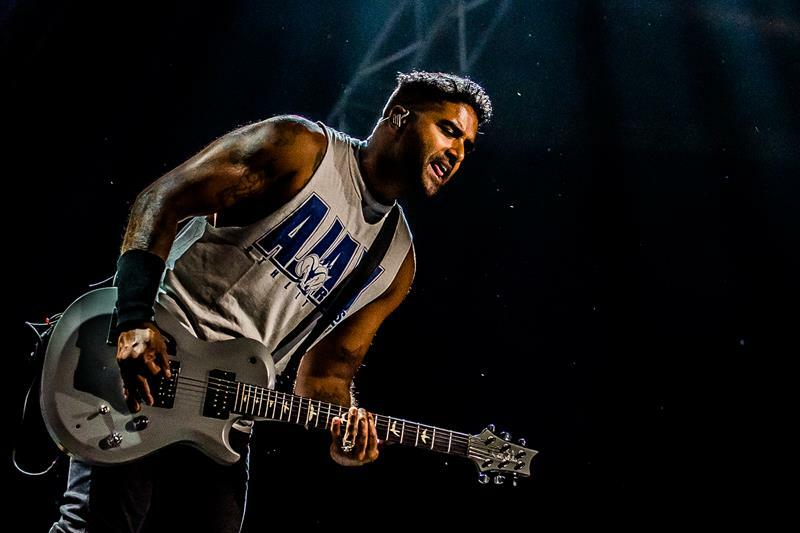 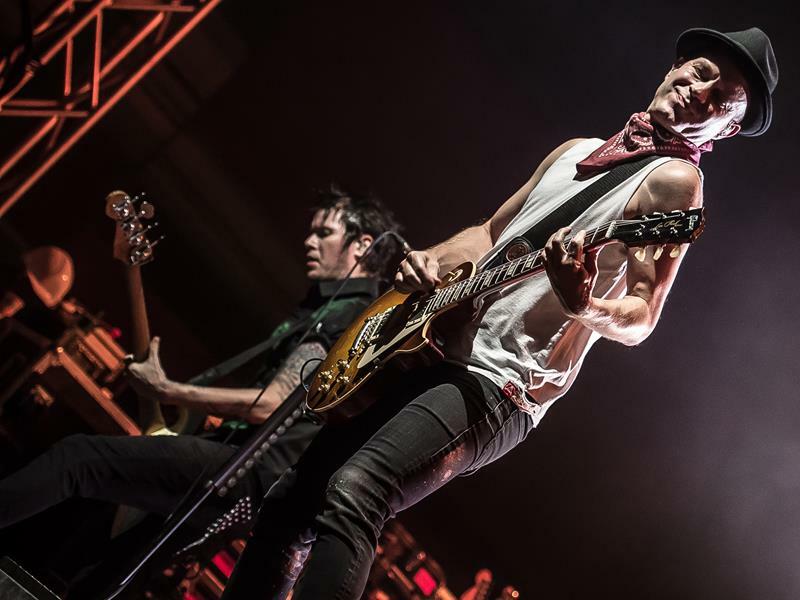 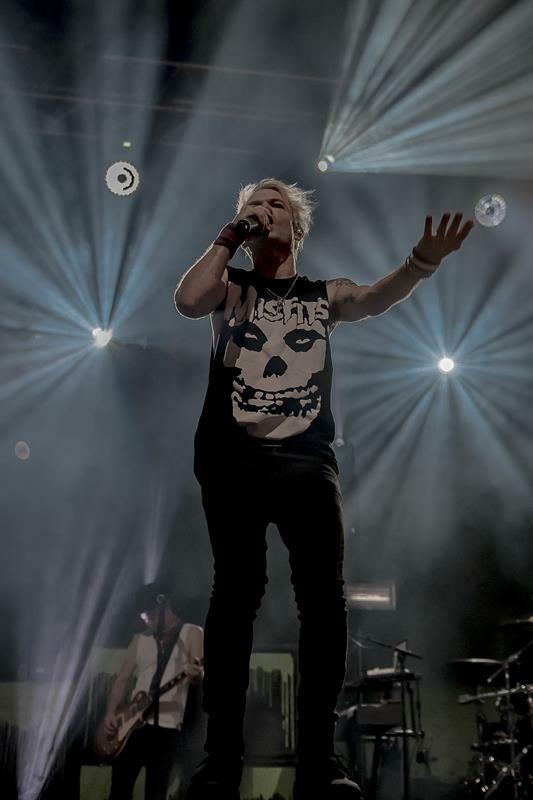 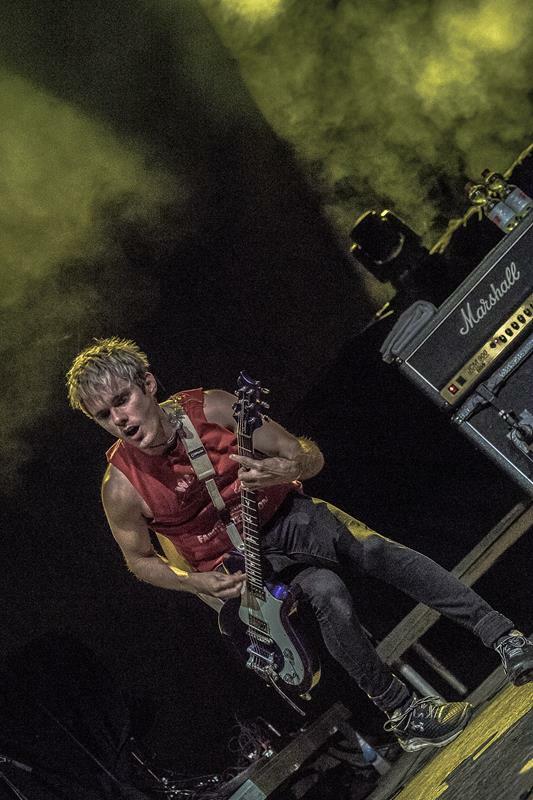 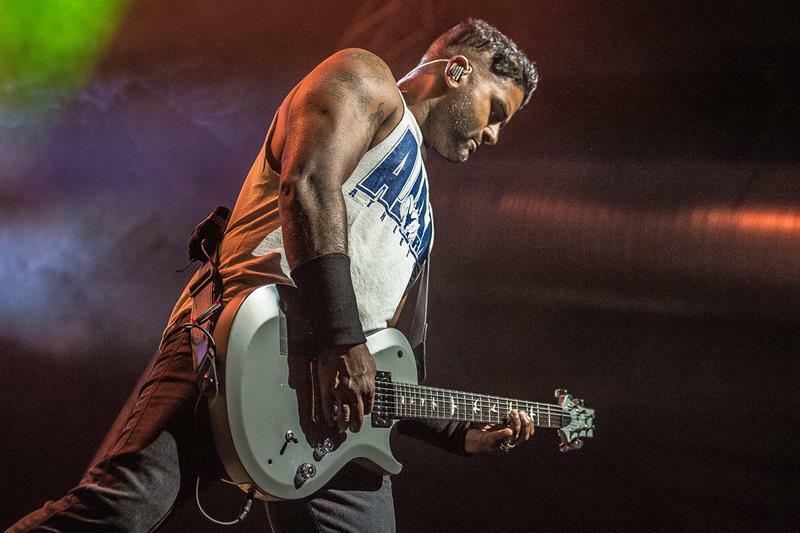 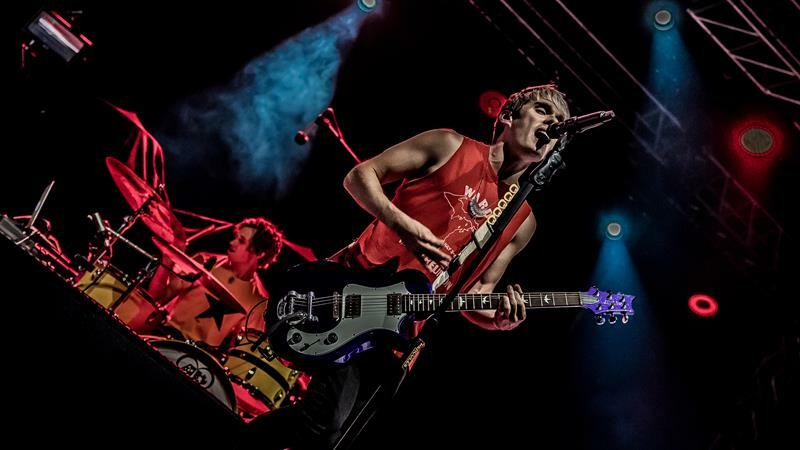 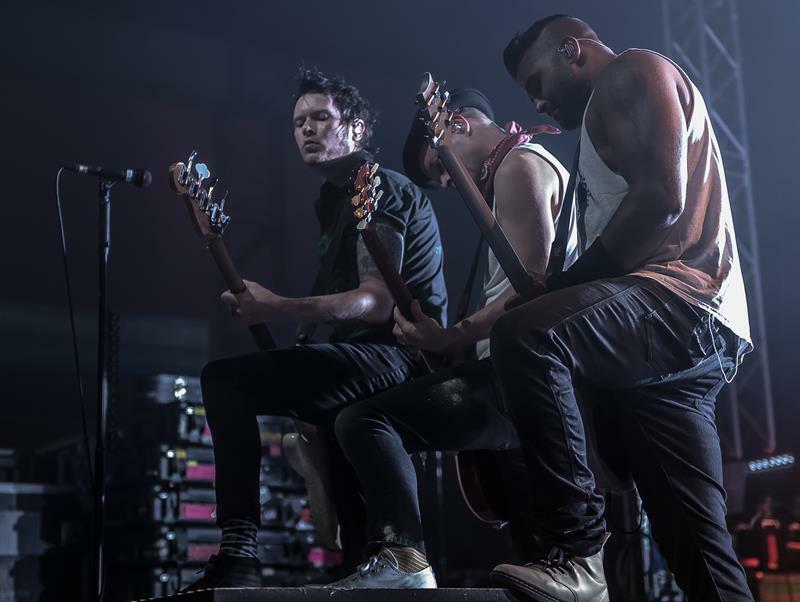 Punk icons SUM41 from Ajax, Canada were returning to Europe after their successful tour last year for three more shows in Germany. 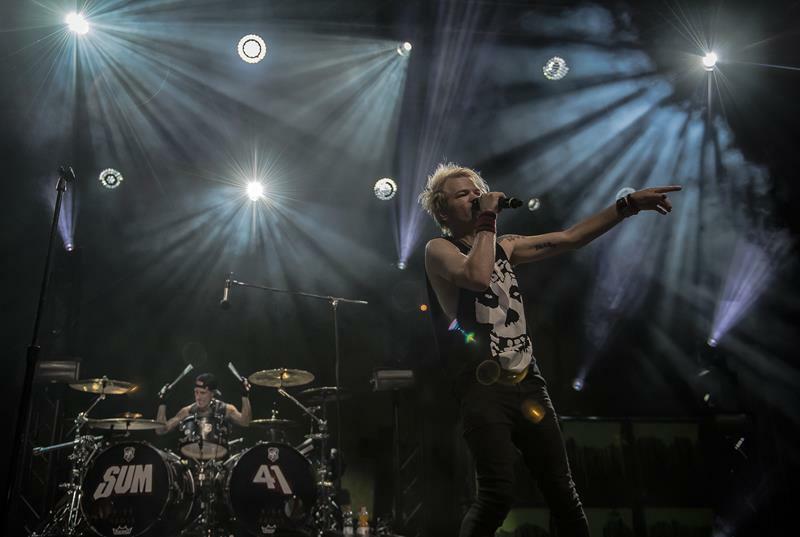 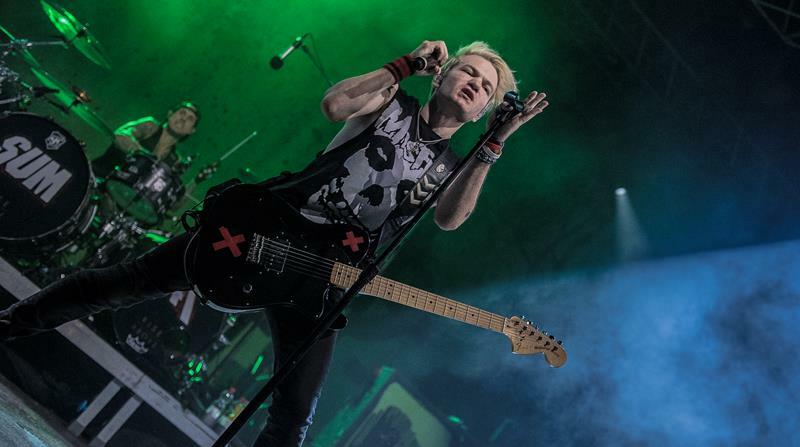 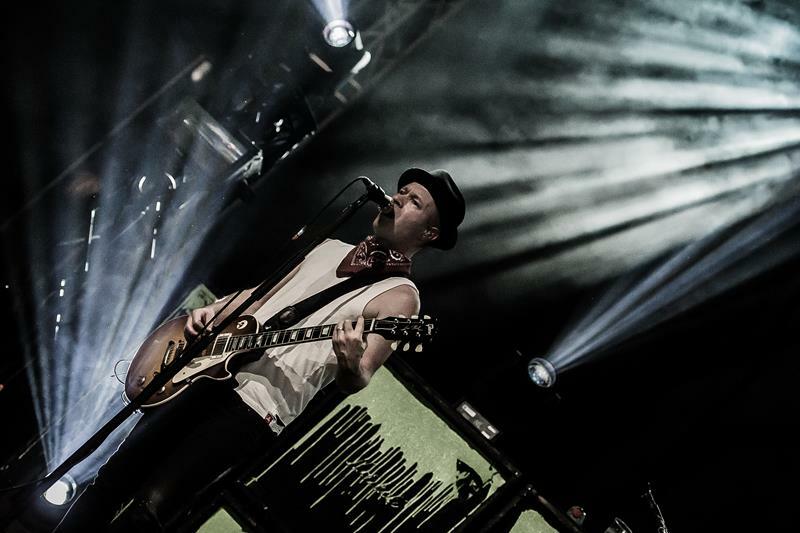 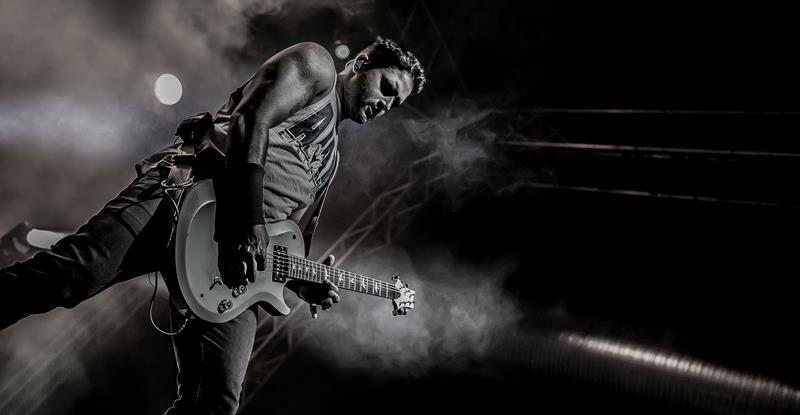 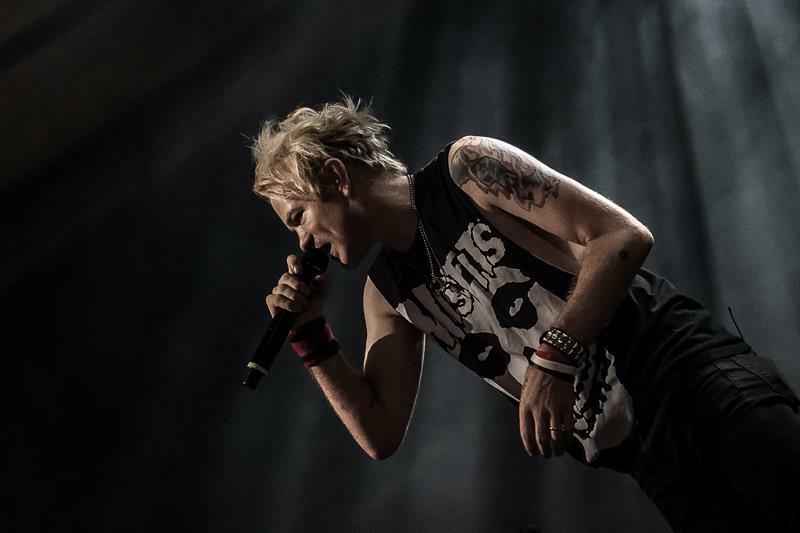 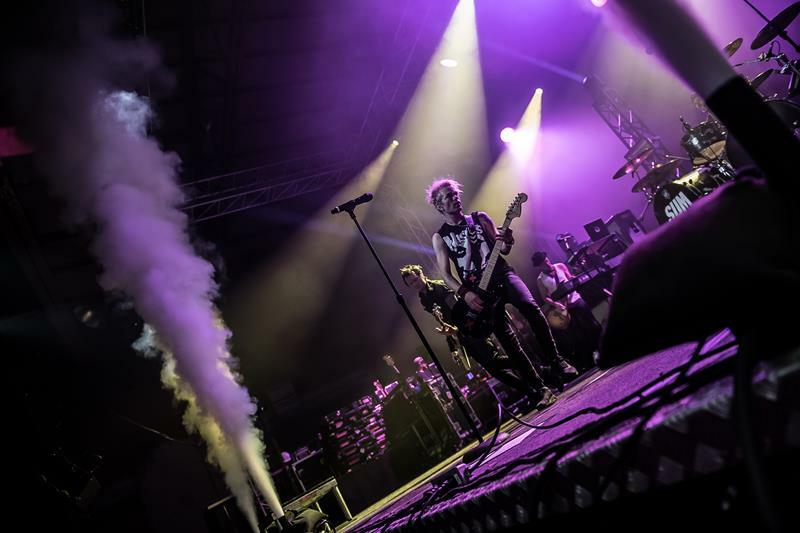 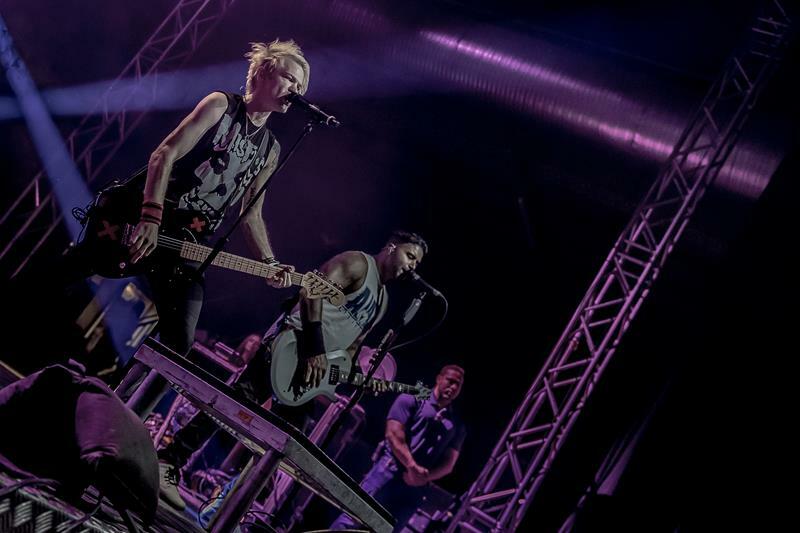 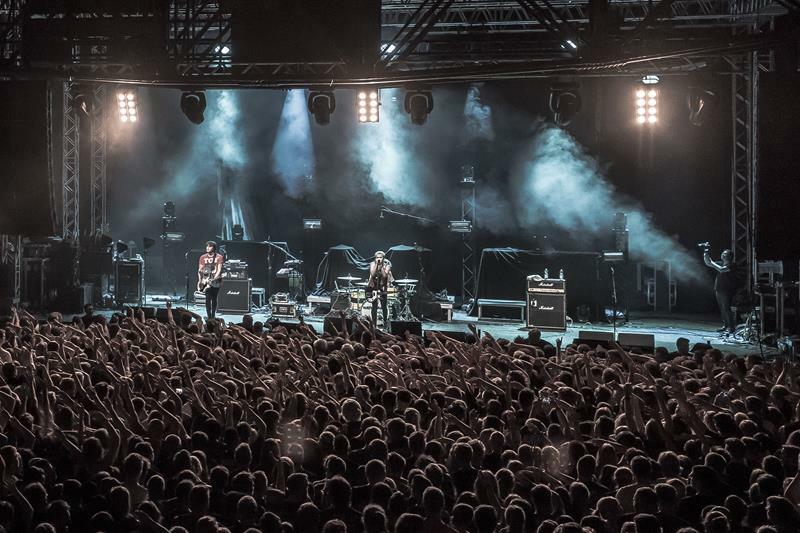 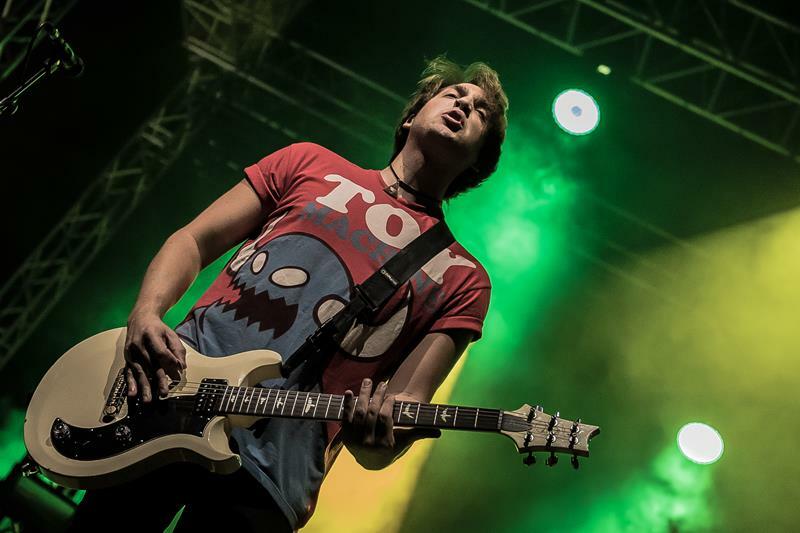 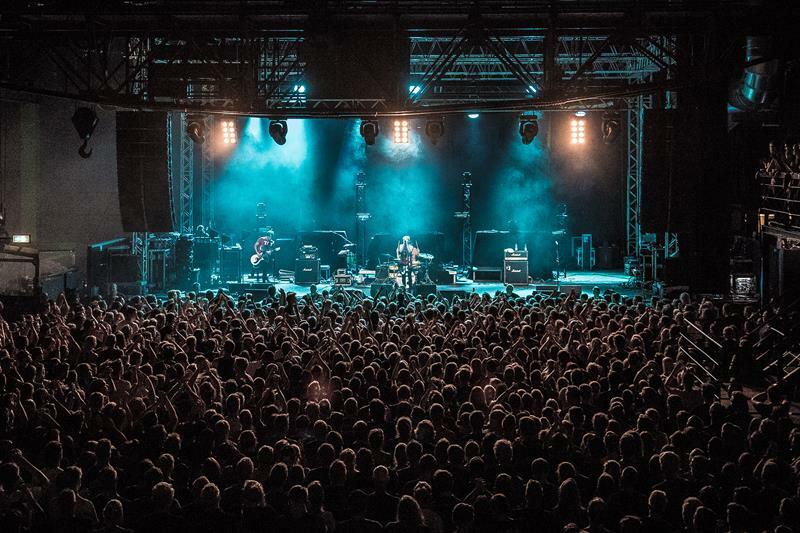 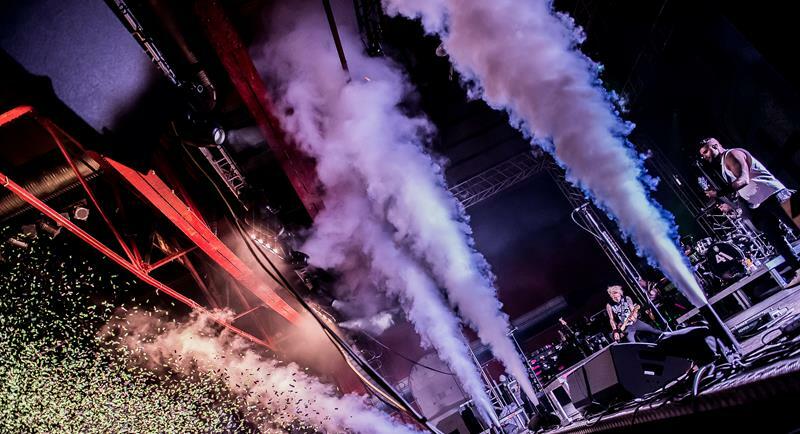 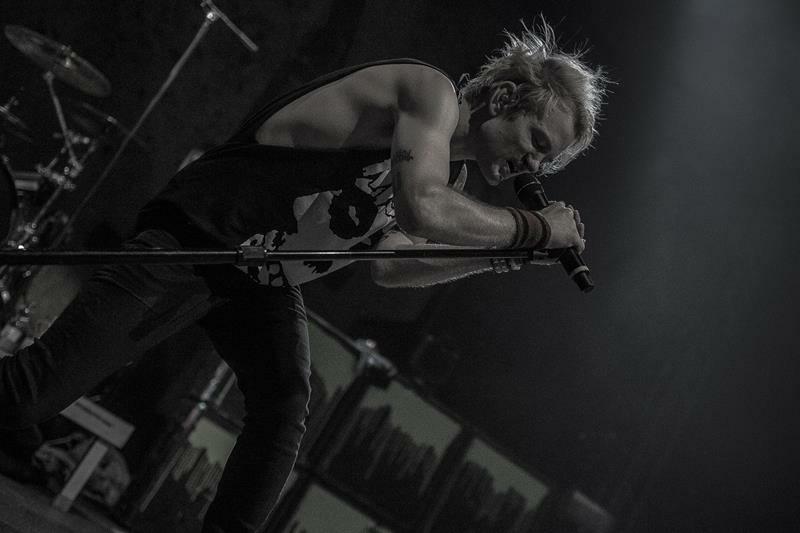 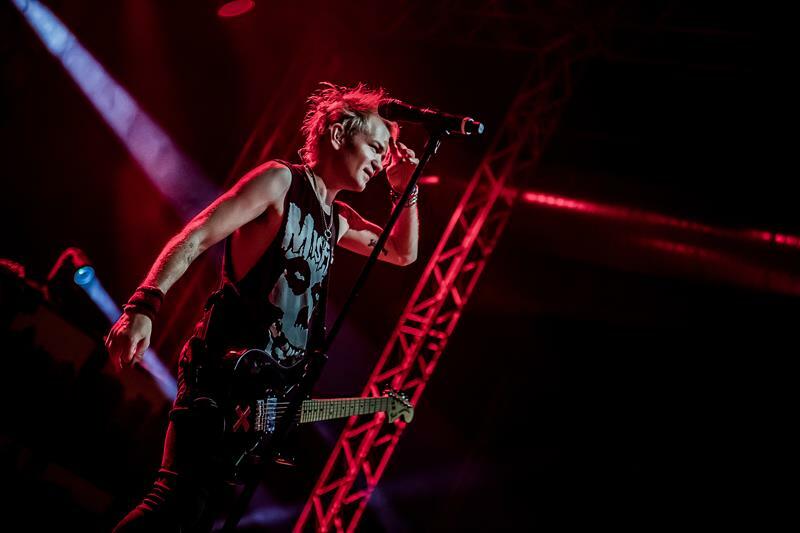 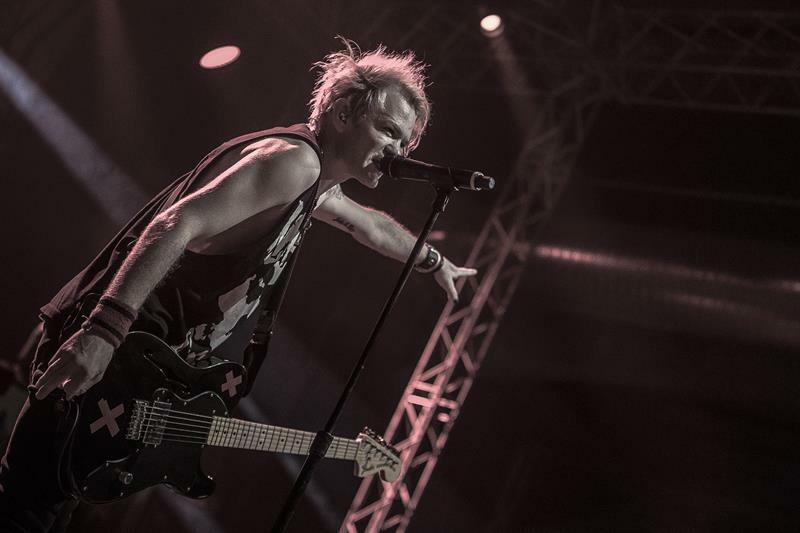 The band around front man Deryck Whibley, that brought you those brilliant songs such as ‘Fat Lip’, ‘In Too Deep’, or ‘Pieces’, is certainly one of the most fascinating live acts, and thousands of people went to see them in the sold-out Turbinenhalle in Oberhausen. 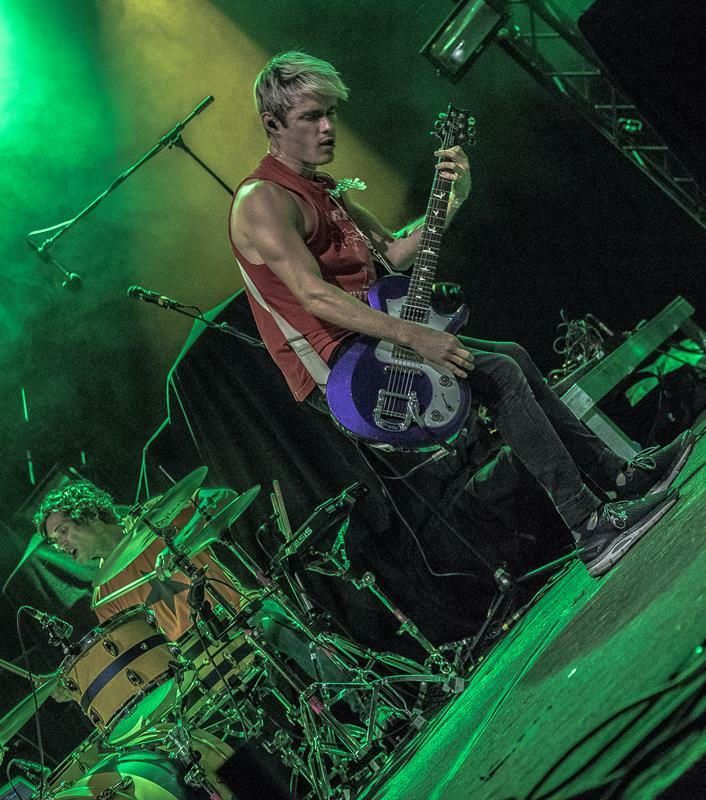 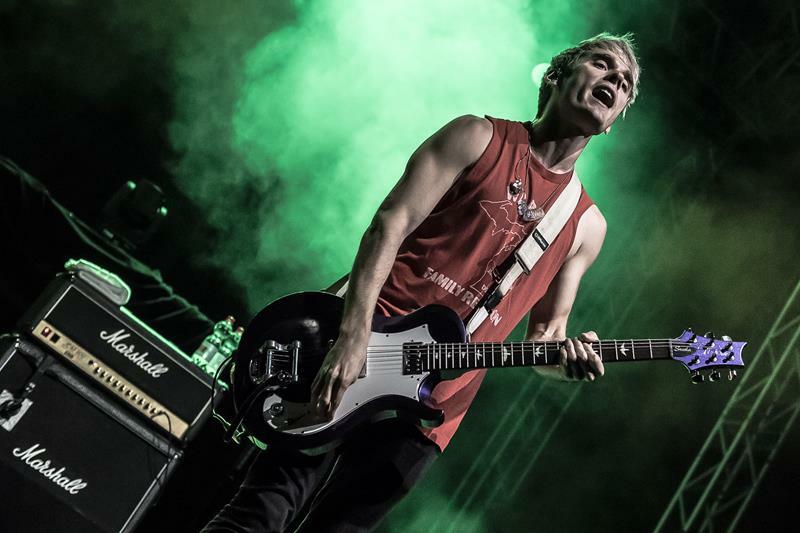 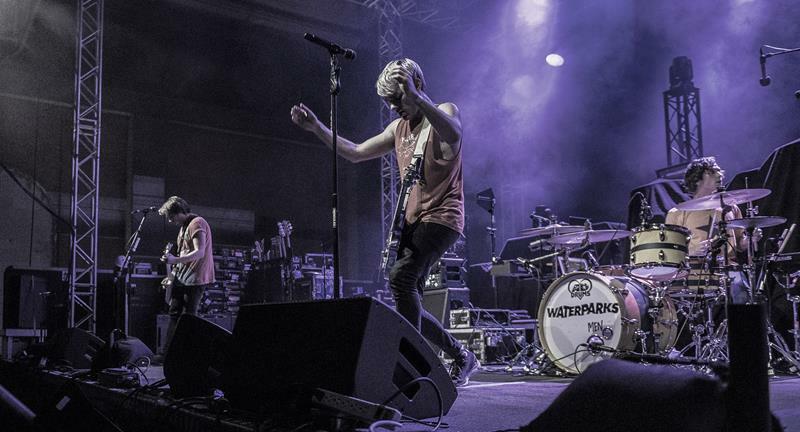 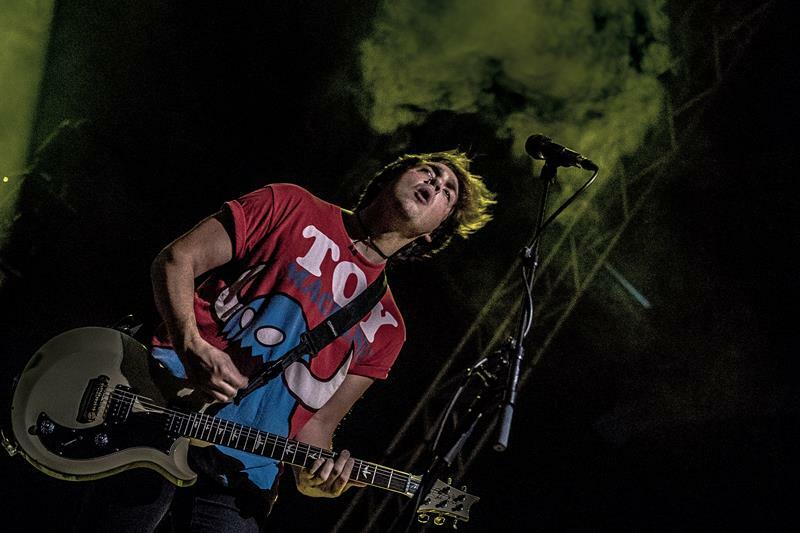 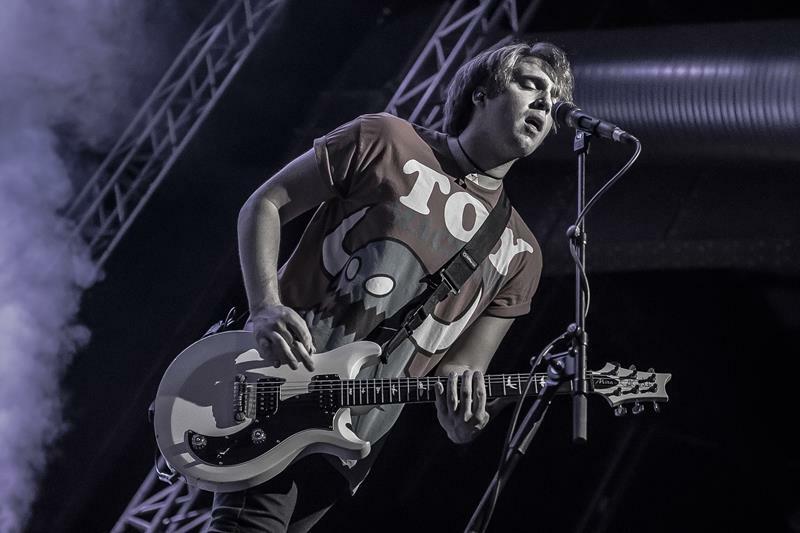 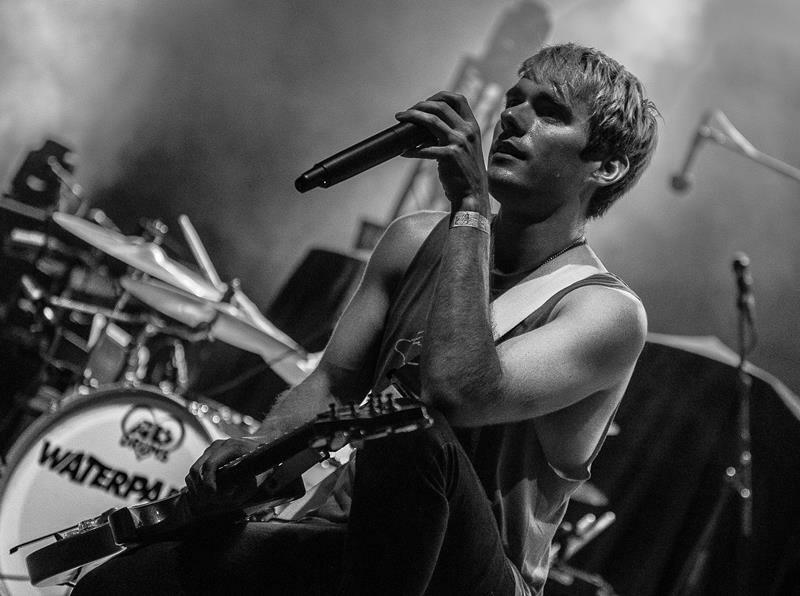 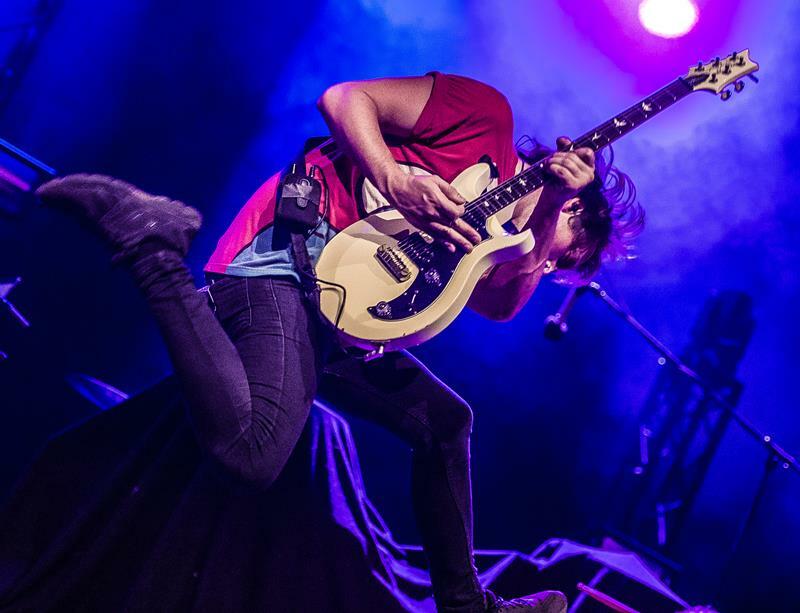 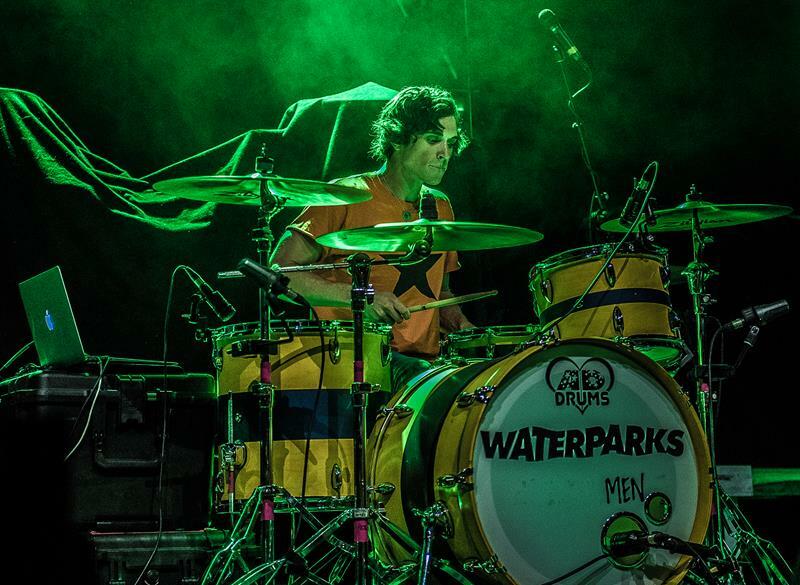 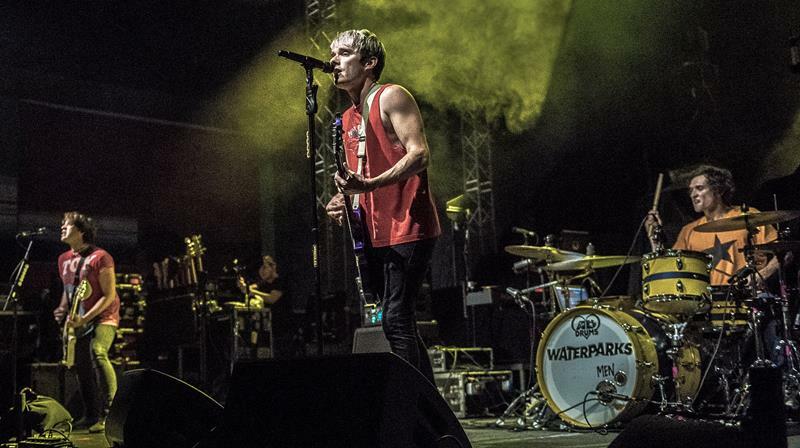 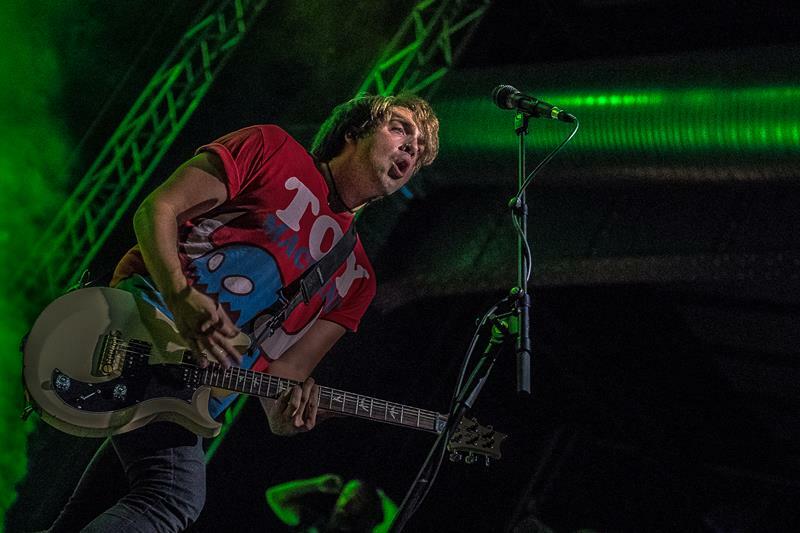 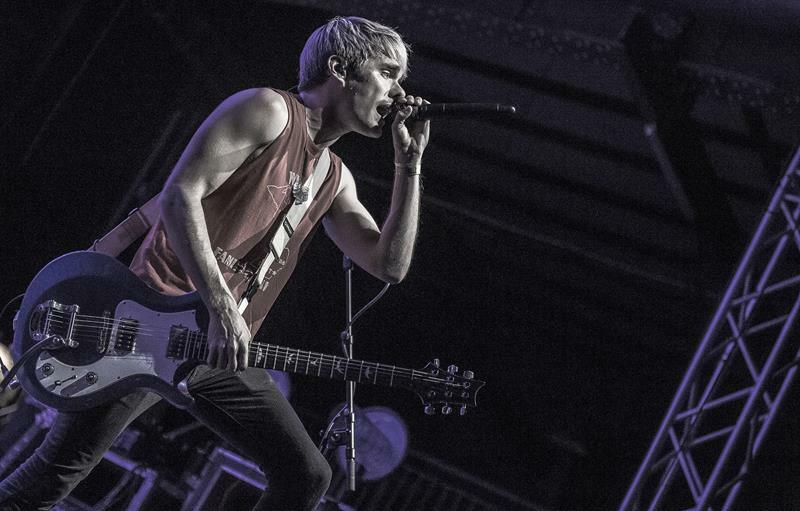 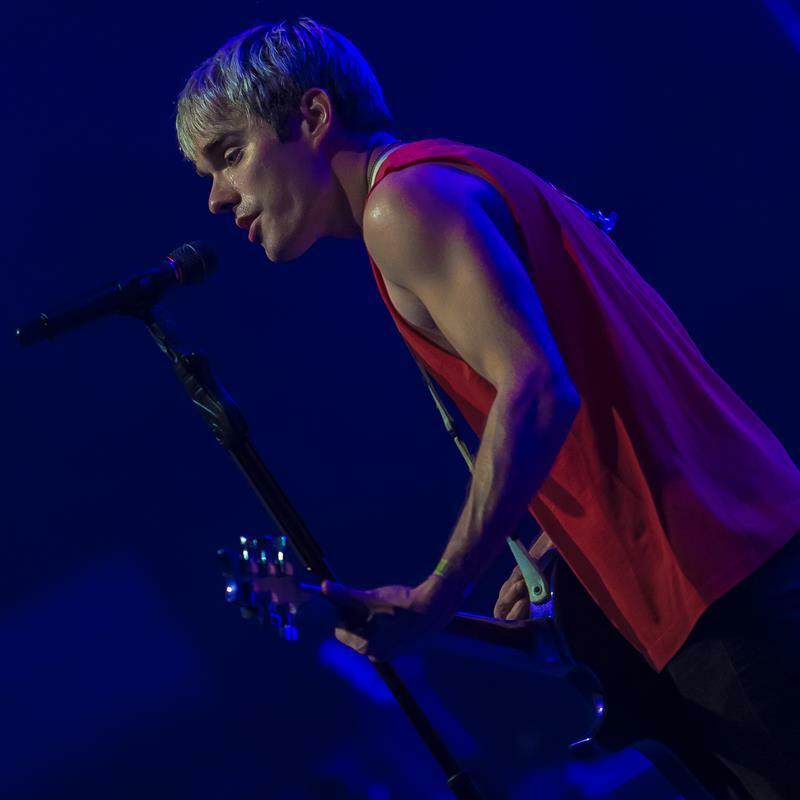 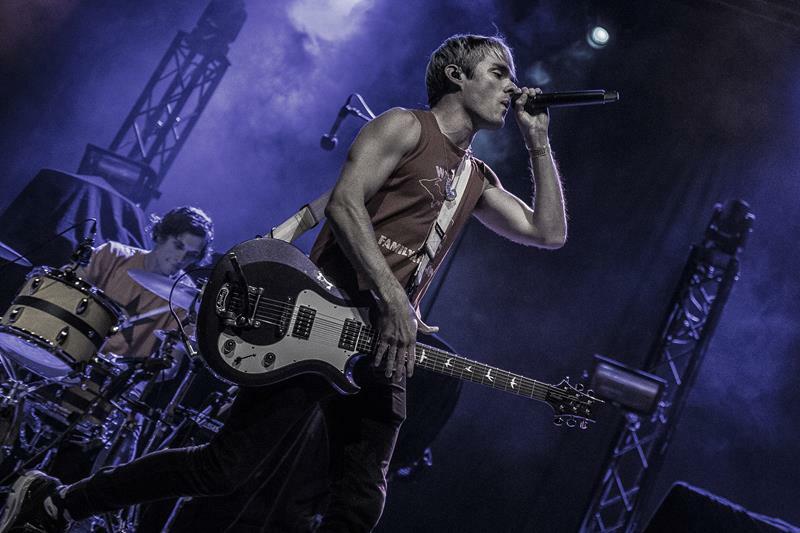 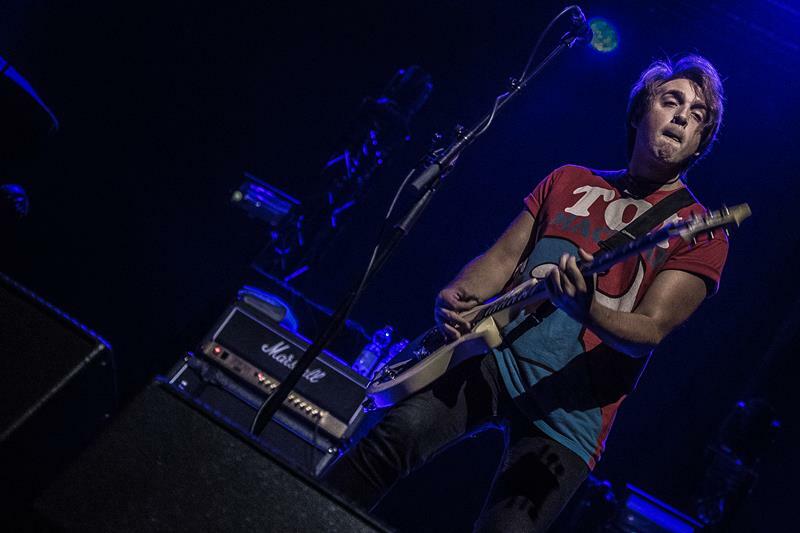 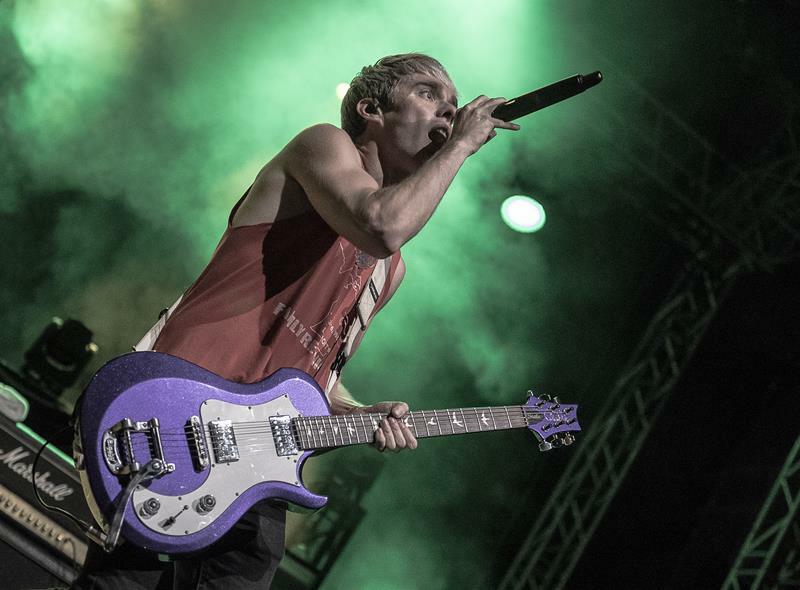 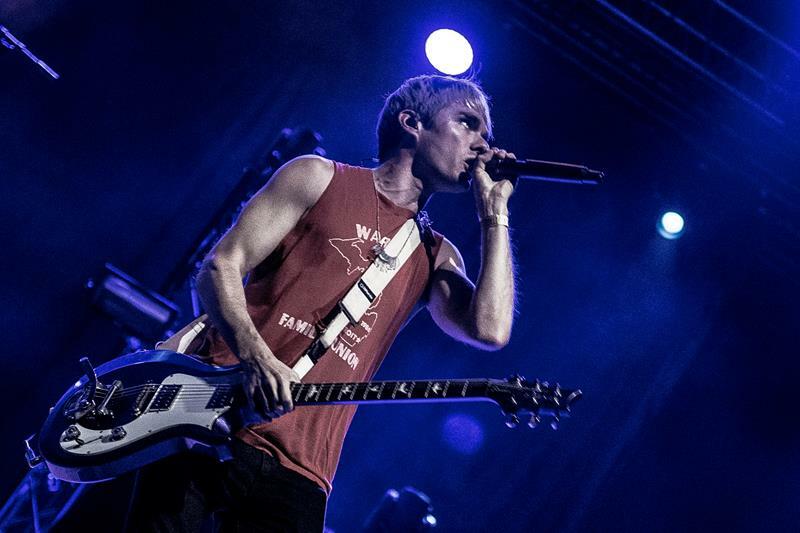 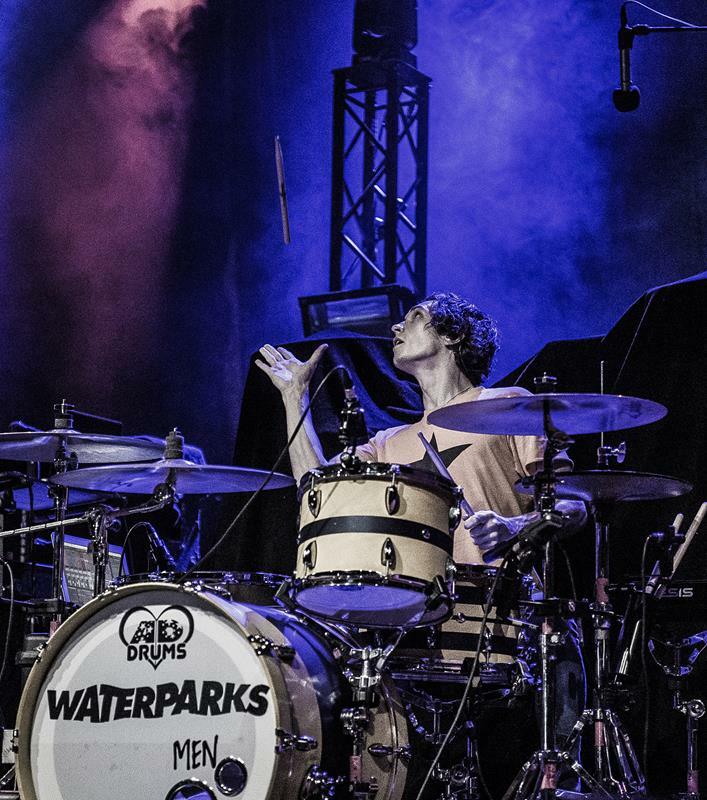 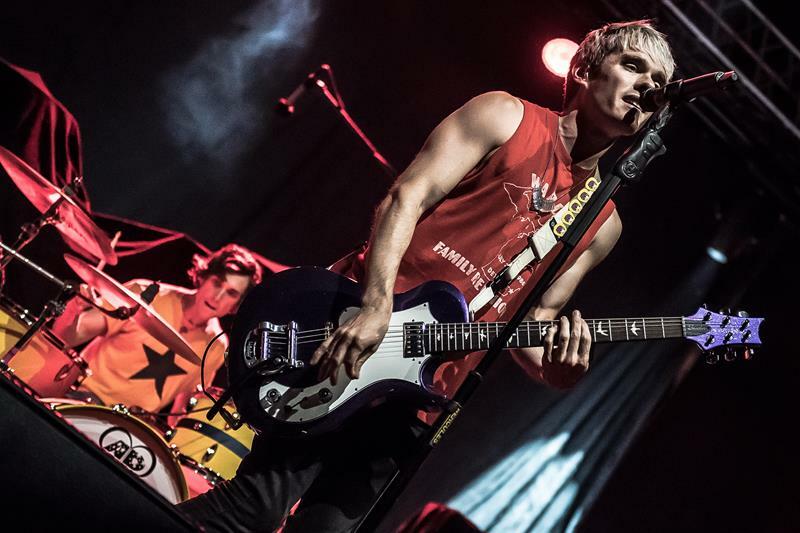 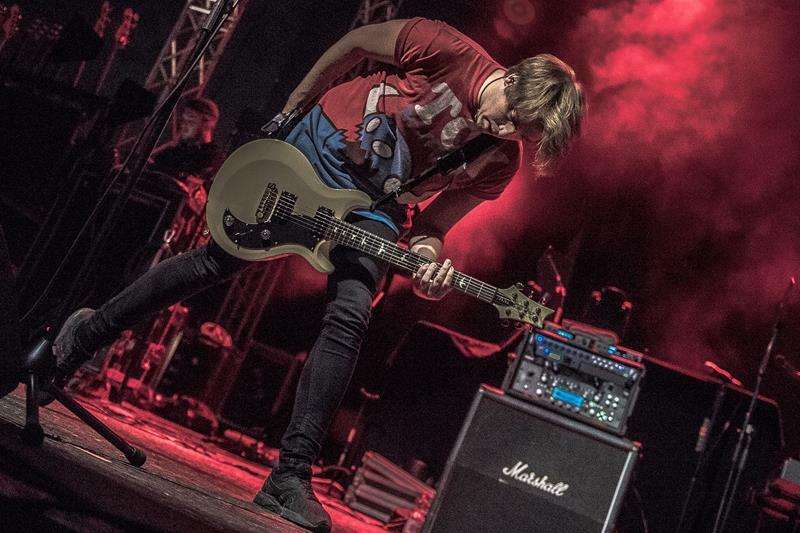 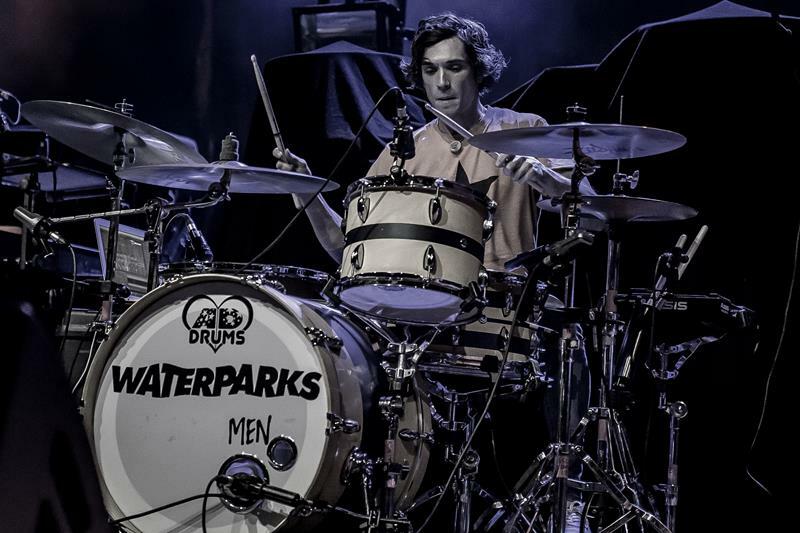 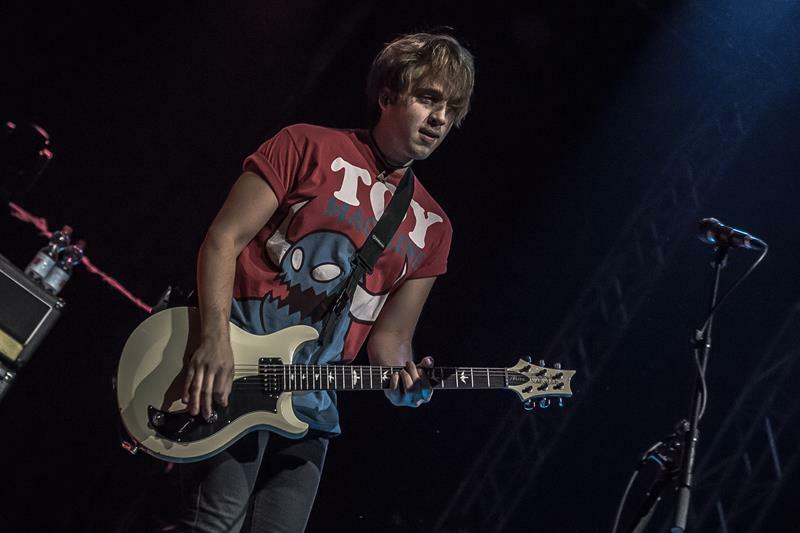 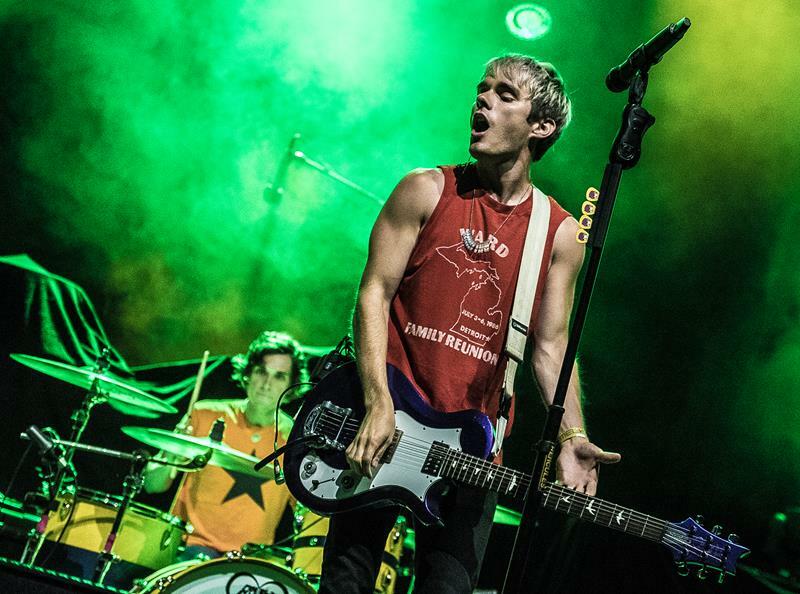 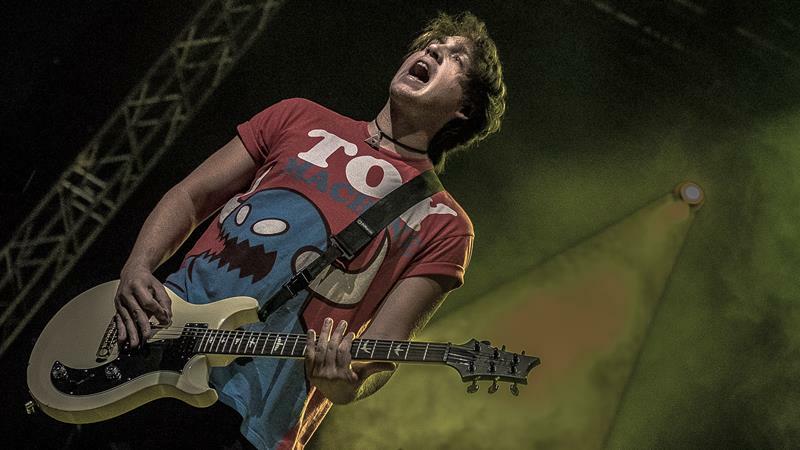 At 8pm sharp, the three members of WATERPARKS went on-stage. 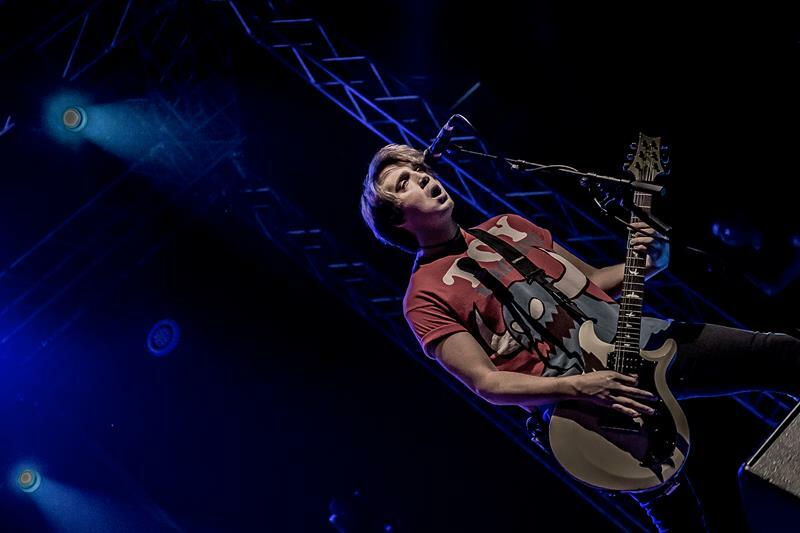 The set-up was a little unusual, with two guitarists (one of which also took care of the singing duties) and a drummer. 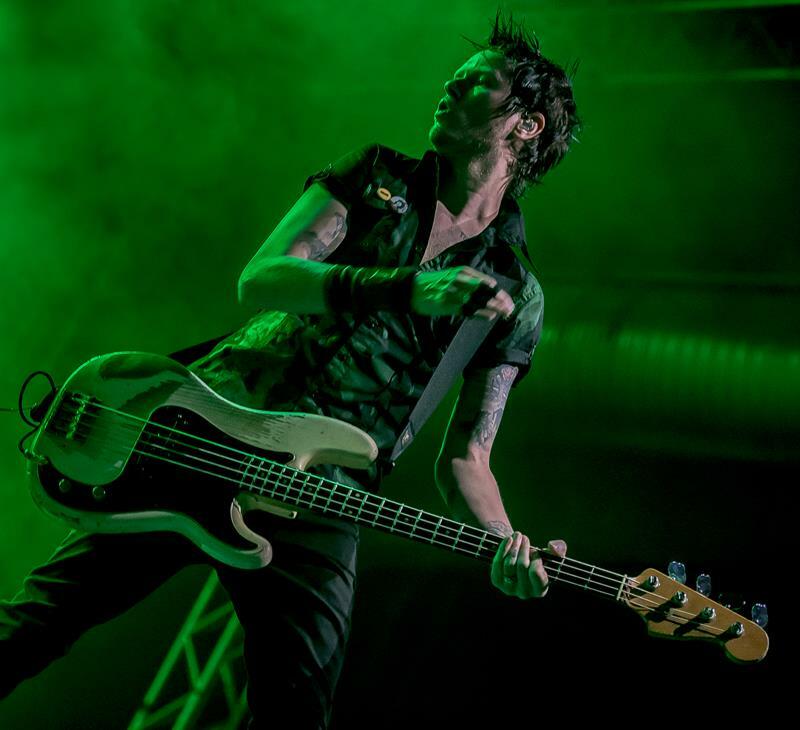 The bass lines, as well as different electronic effects were played from tape. 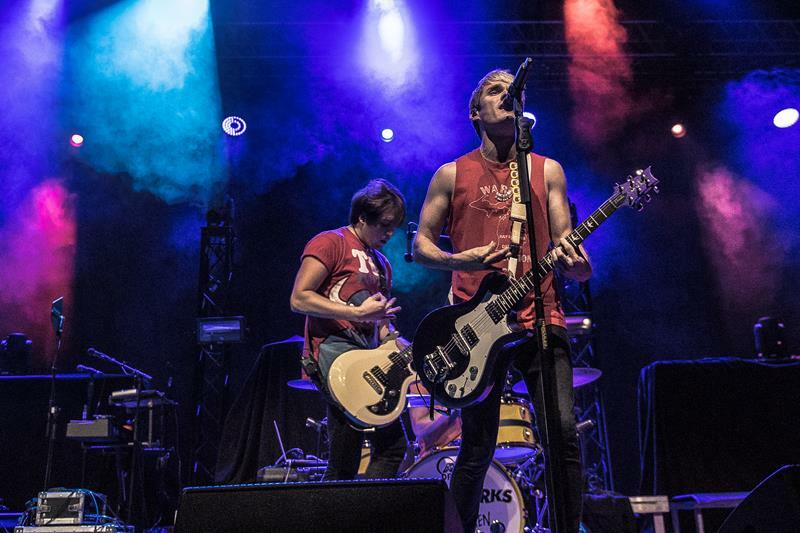 The music they played sounded like pretty college pop with kinda cute melodies. 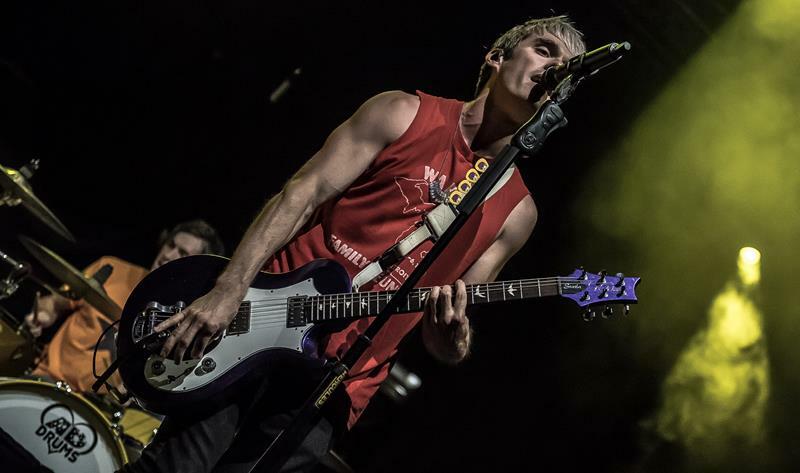 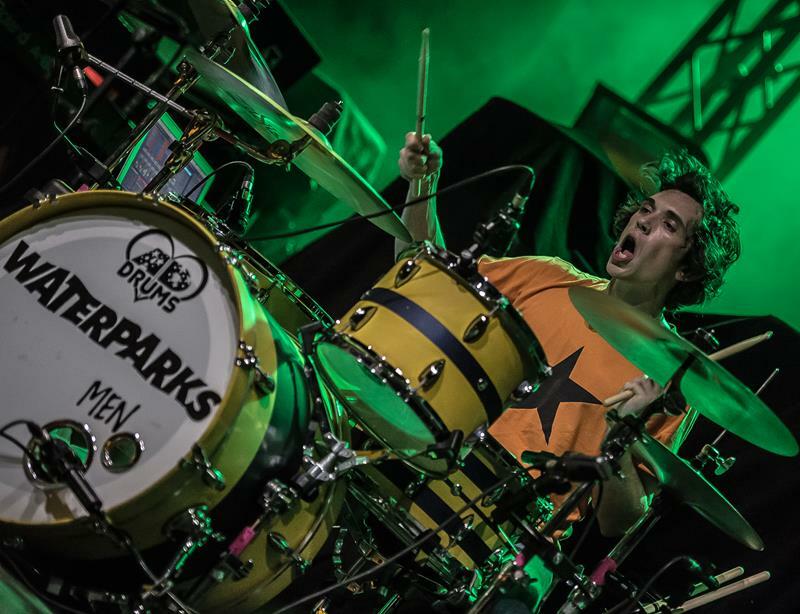 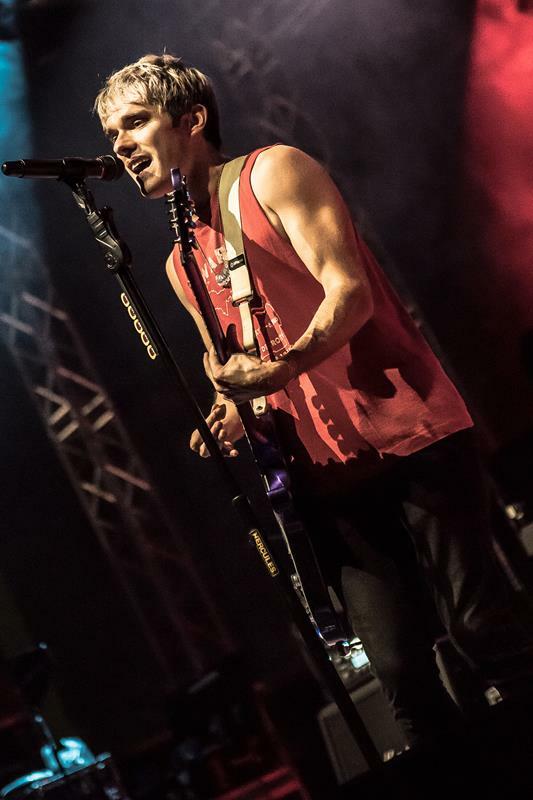 Singer Otto Wood’s voice came across pretty creaky, and at times it felt like he was singing in frequency bands where he was not completely comfortable. 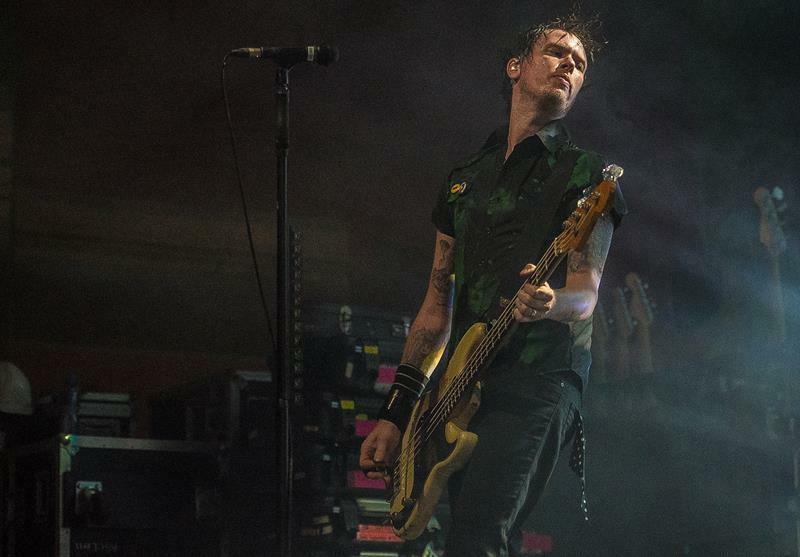 Additionally, bass and electronic effects played from record lent some kind of playback feel to the gig, which felt a little off. 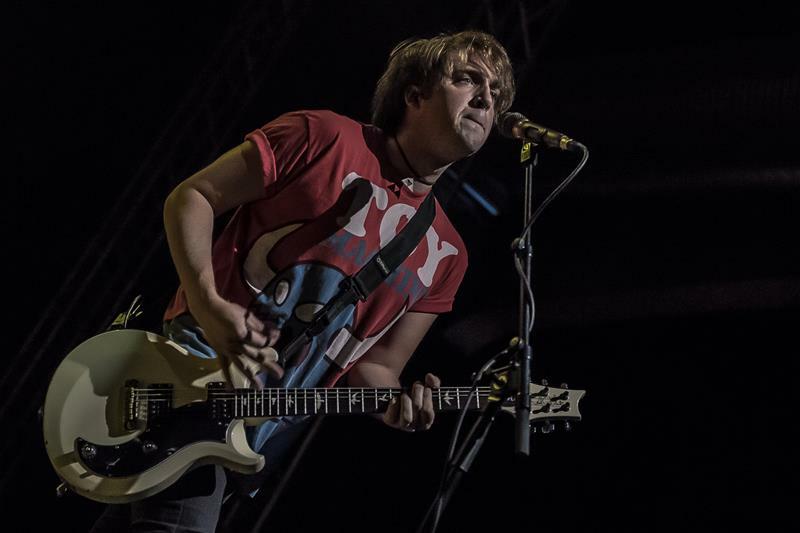 This translated in little enthusiasm transpiring to the rather young audience in the front stage area, so when Otto demanded a large circle pit for the song ‘Sleep Alone’, only a few people in the side areas returned the favour, and it seemed not many people were really sad when WATERPARK’s gig ended after forty minutes. 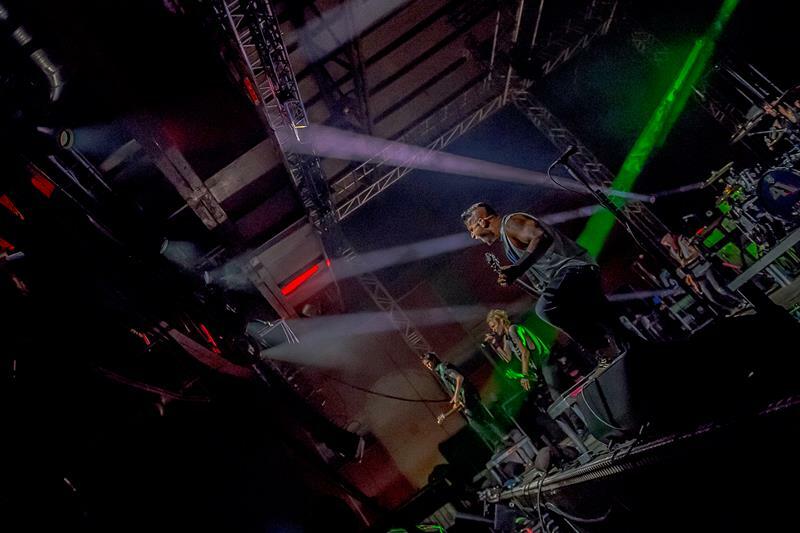 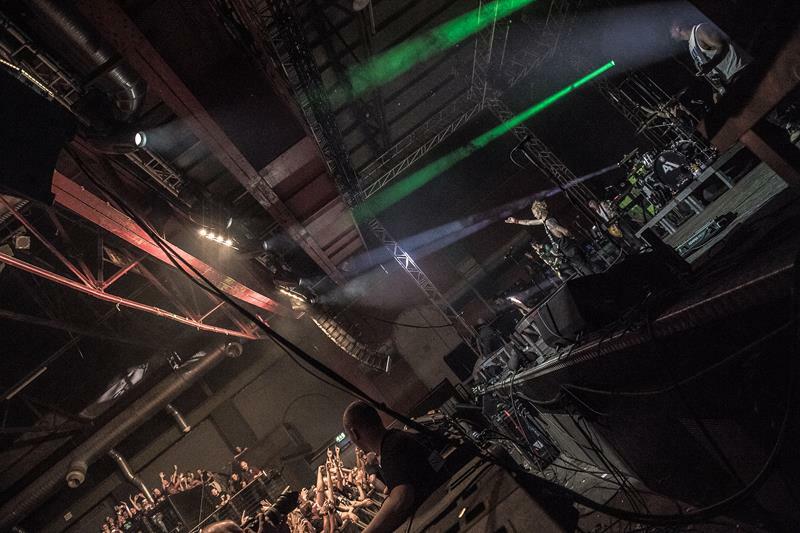 During the stage break of a good 30 minutes, you could feel the oxygen levels inside the packed Turbinenhalle go down, and the anticipation as well as the temperature levels rise by the minute. 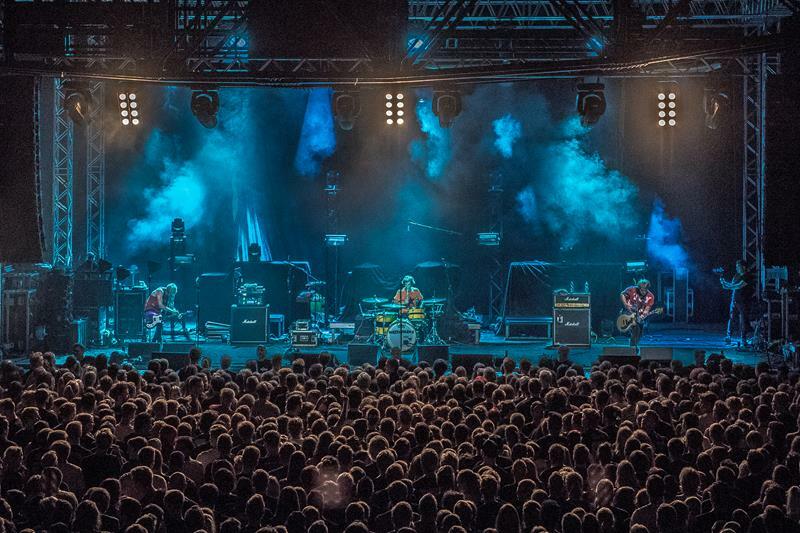 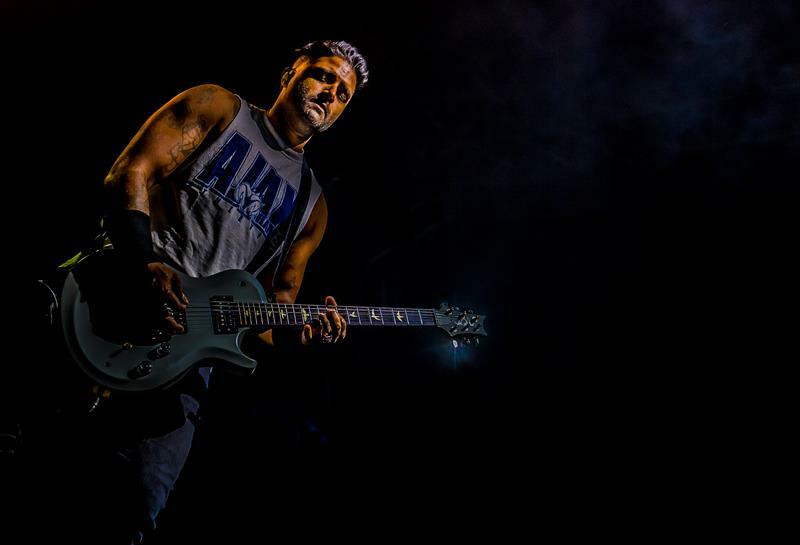 Fortunately enough, the sound crew played a nice selection of Metal and Punk Rock songs to keep the crowd entertained, while a white curtain was put up in front to shield the stage from curious gazes of the audience. 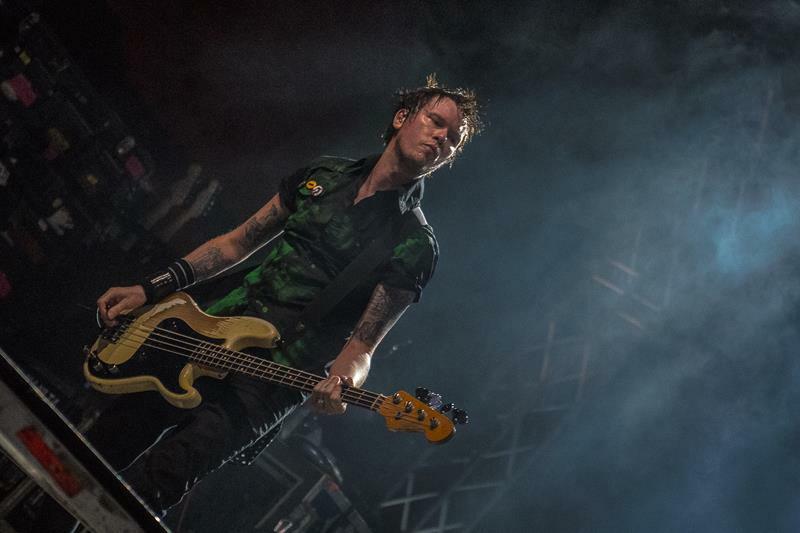 This culminated around 9:15pm, when the lights went out, and a nice light show illuminated the stage, while a wild mash-up containing AC/DC riffs, James Brown vocals, and Rockabilly was played. 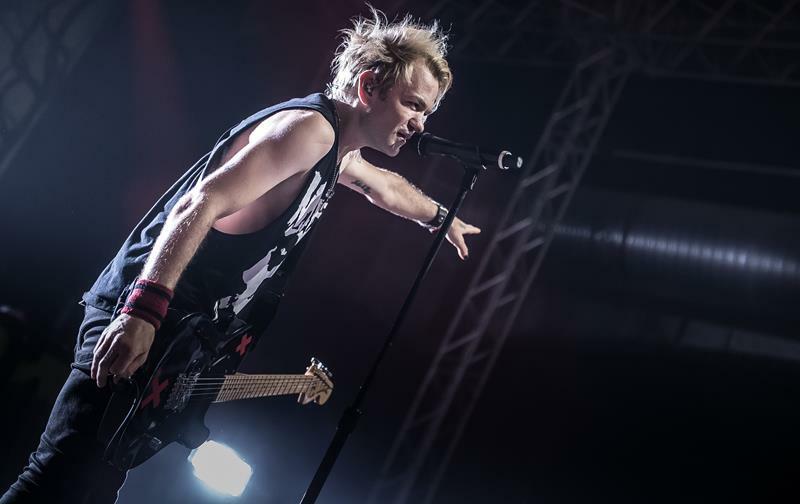 After a few moments the curtain fell, and SUM41 kicked it off with ‘The Hell Song’ in a fulminant way with big loads of confetti. 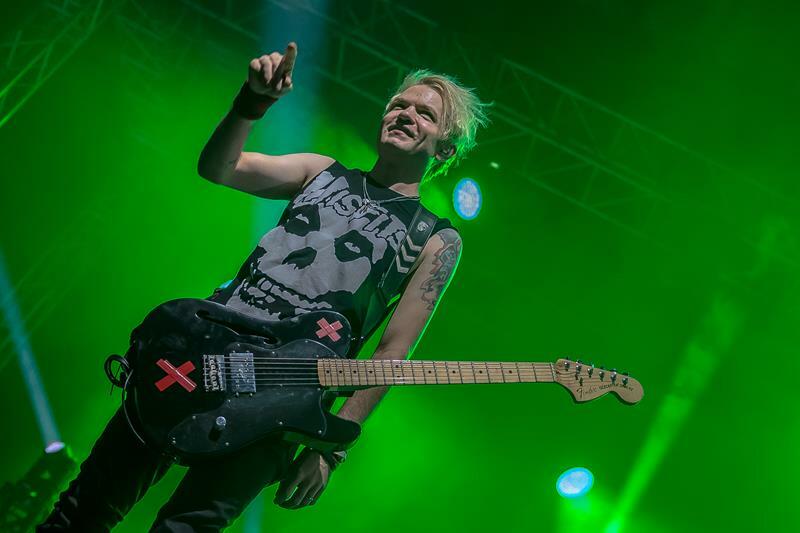 The crowd in the whole main area in front of the stage went nuts within seconds, and by the time SUM41 played their second song, ‘Motivation’, security had their hands full in pulling people out from the crowd, who clearly had not expected this kind of insanity. 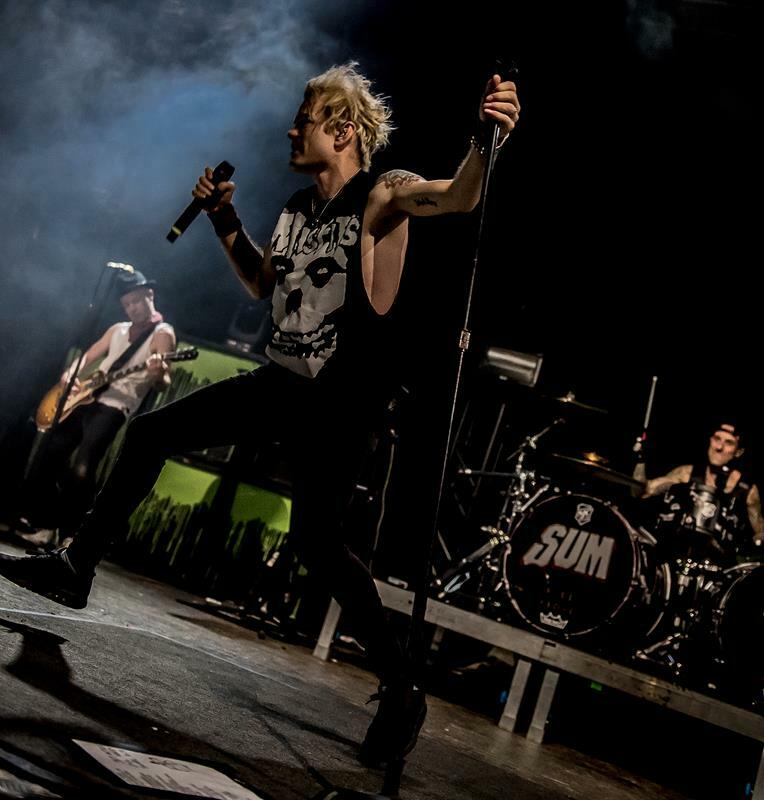 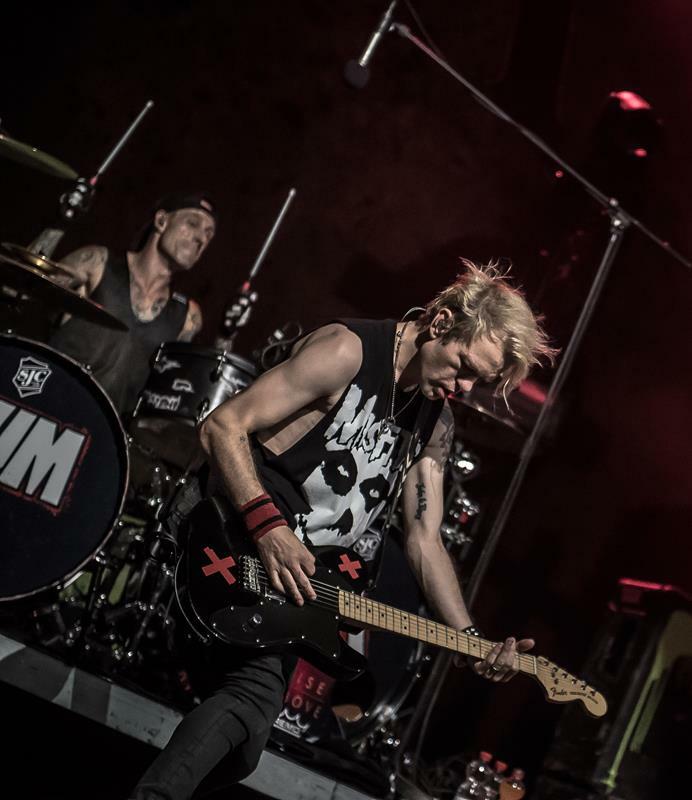 It seemed like the name of SUM41’s debut would be the motto of the evening, as there was literally ‘All Killer No Filler’ in the band’s set list. 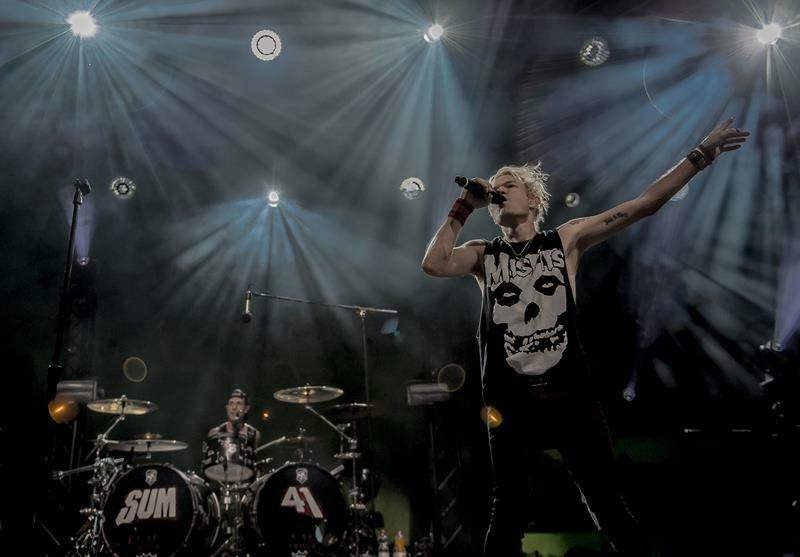 But SUM41 did not only play their hits. 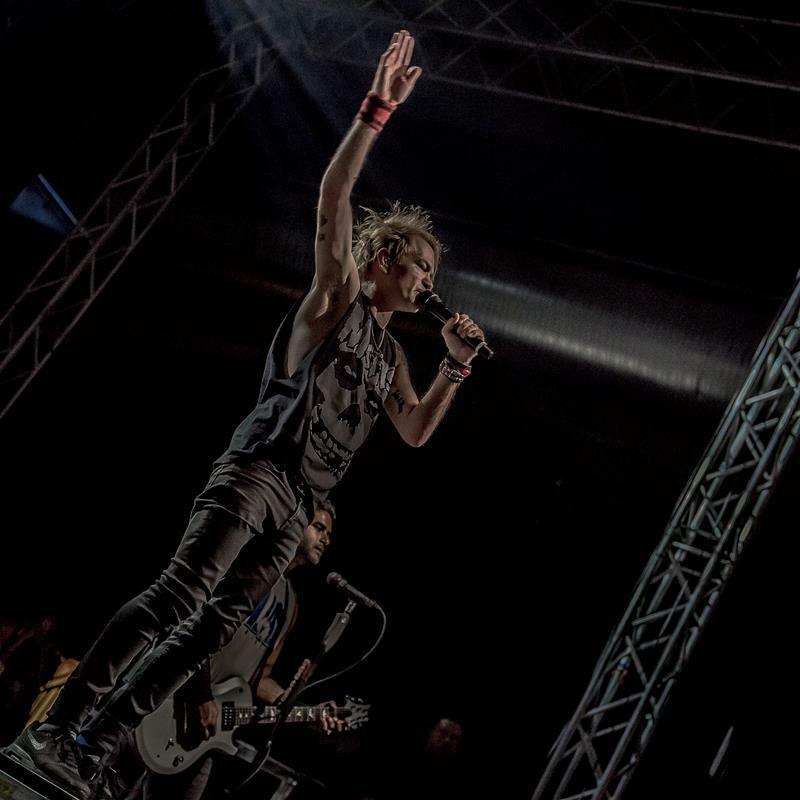 Additionally, they paid tributes by teasing all kinds of cover songs. 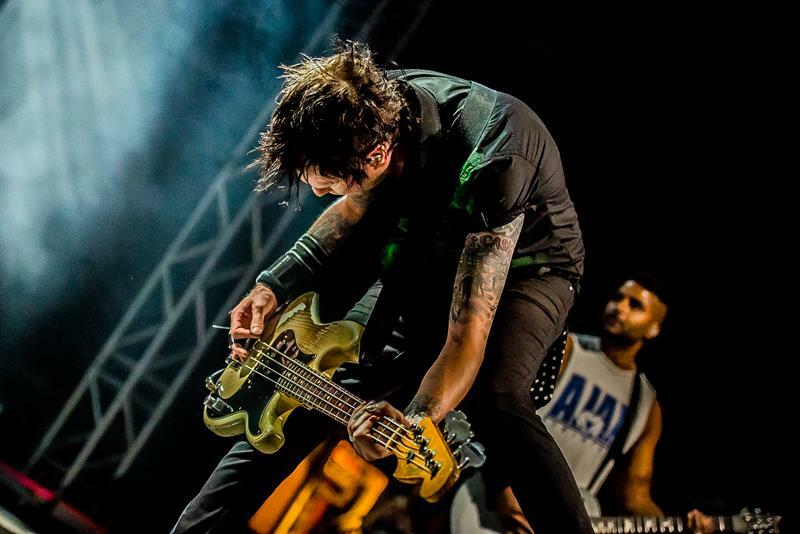 So, before playing ‘Mr. 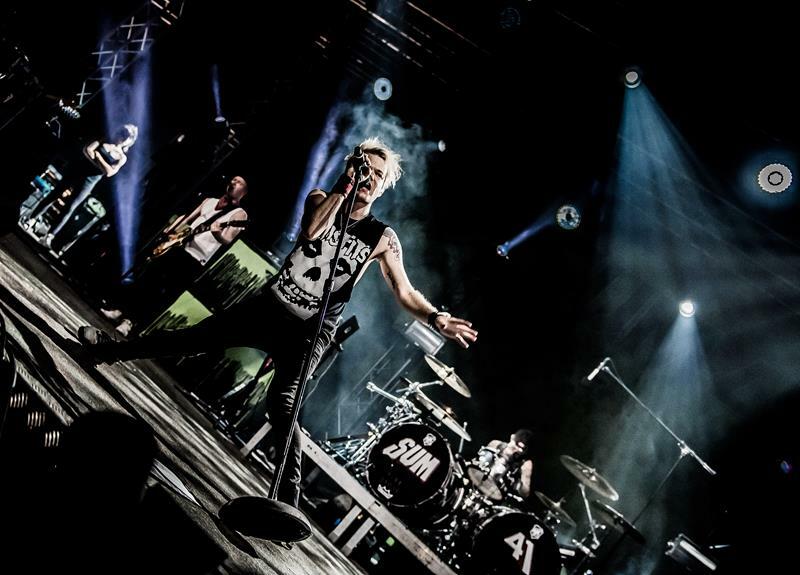 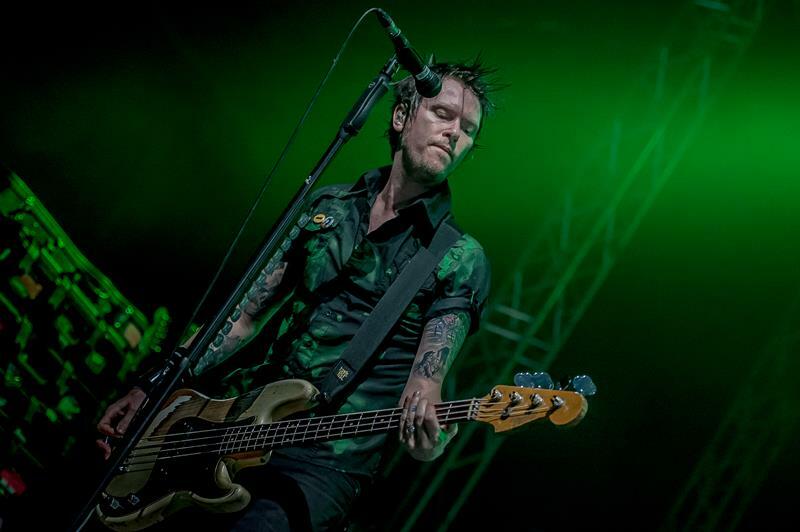 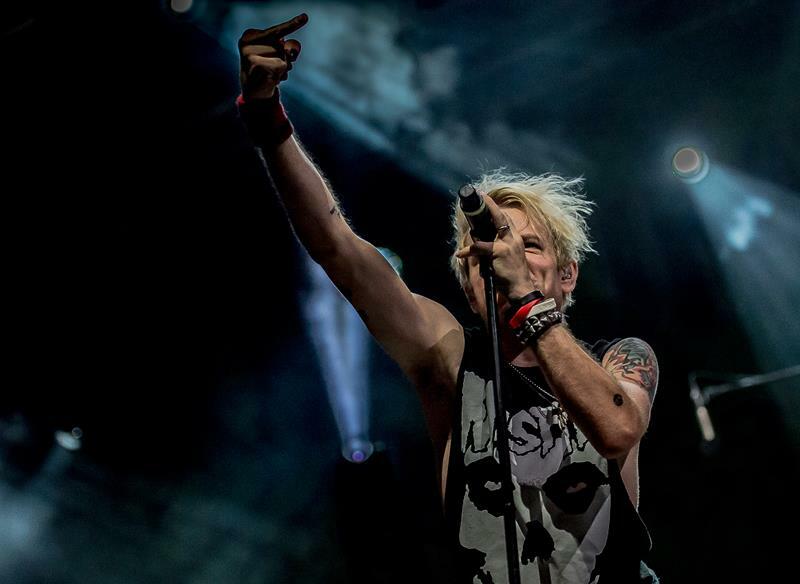 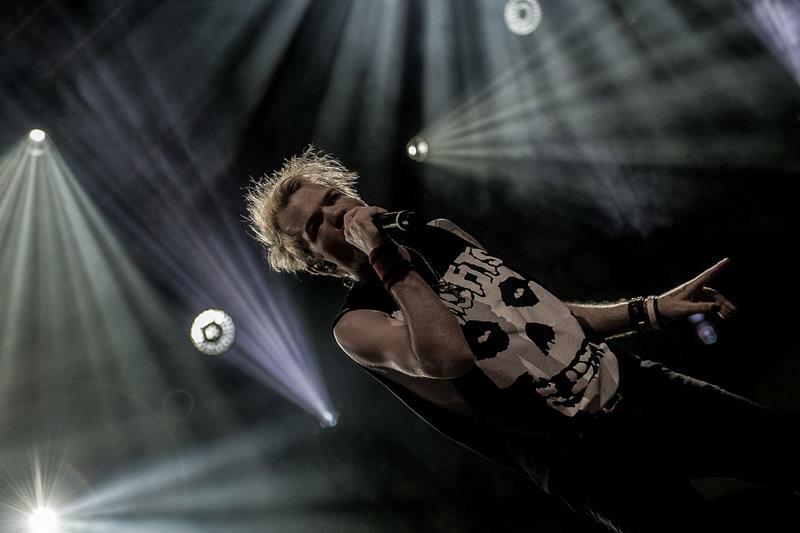 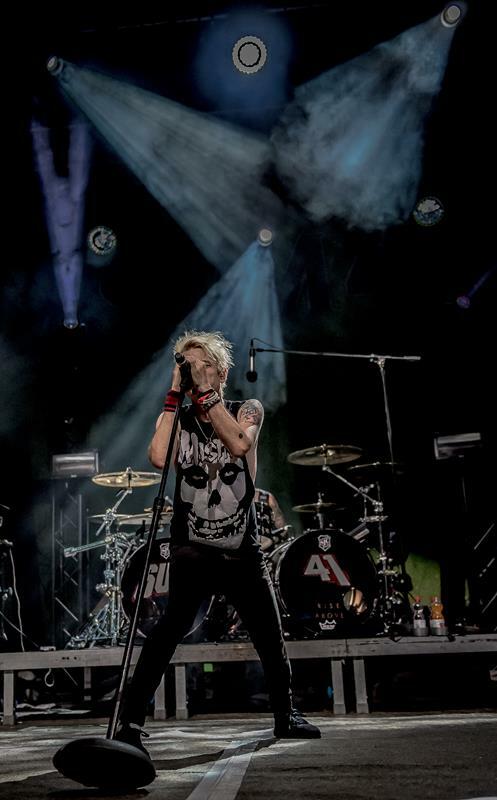 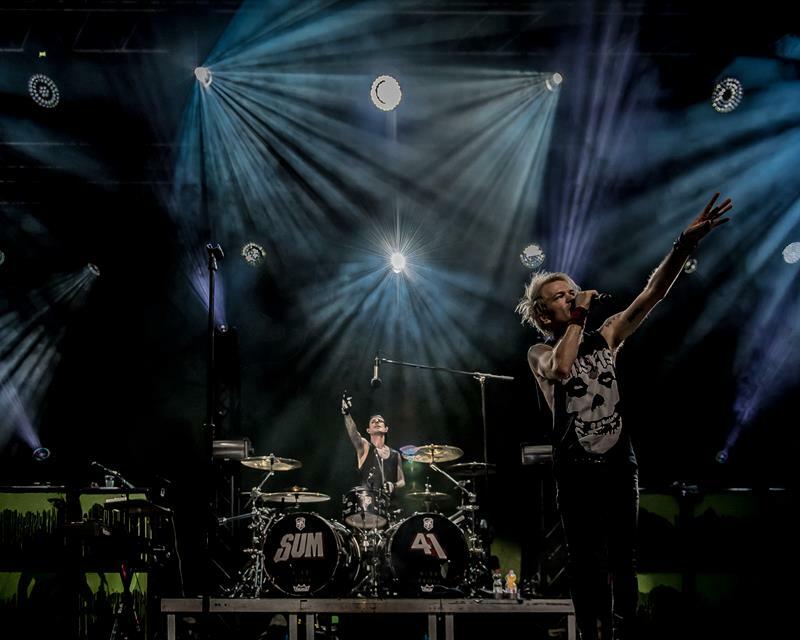 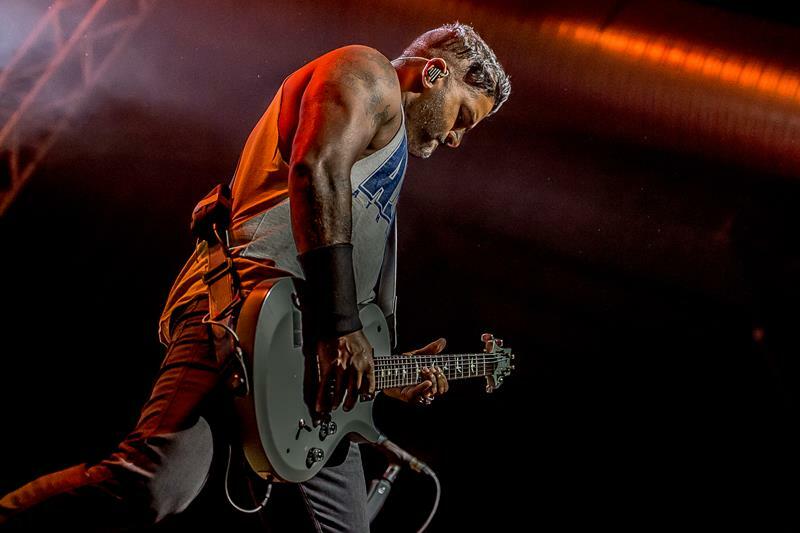 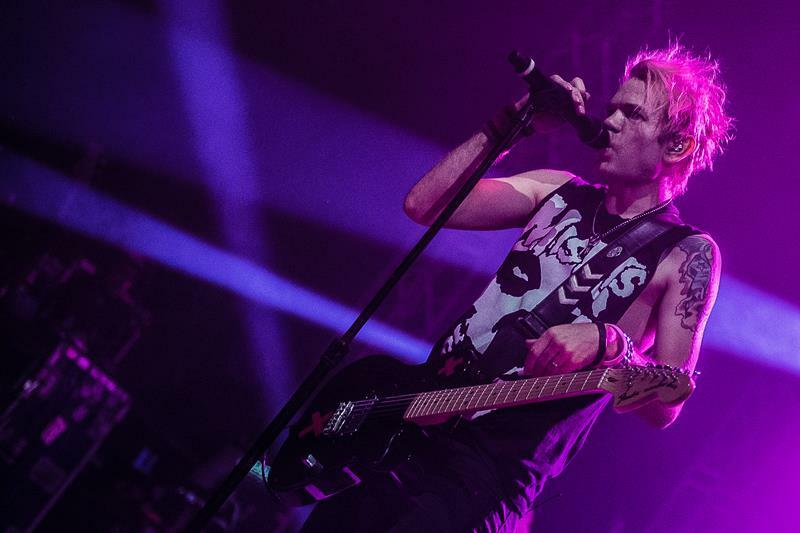 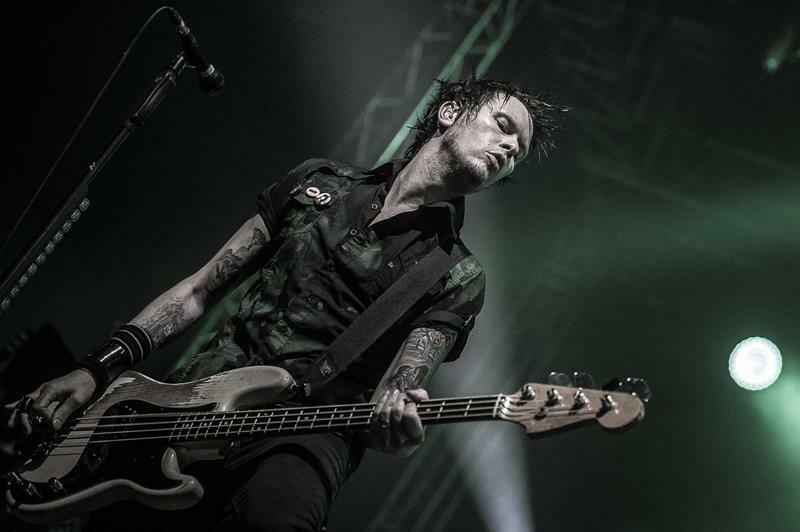 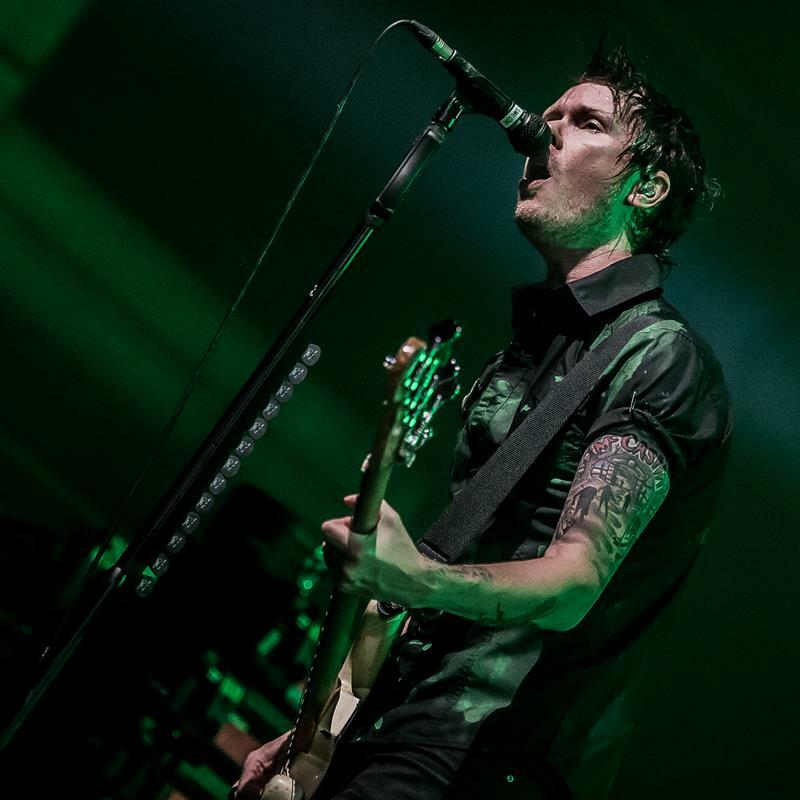 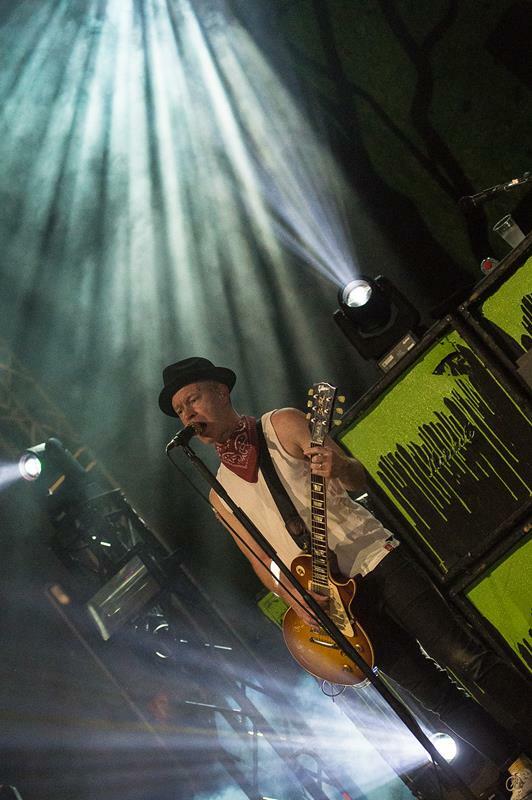 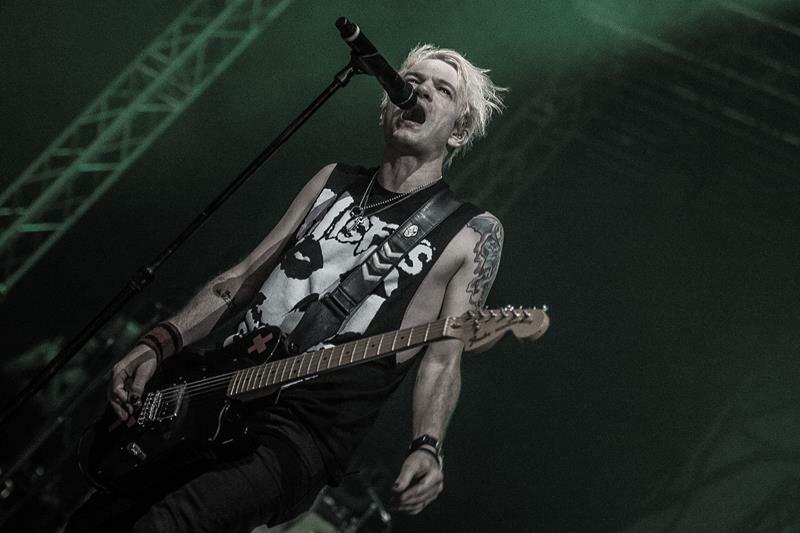 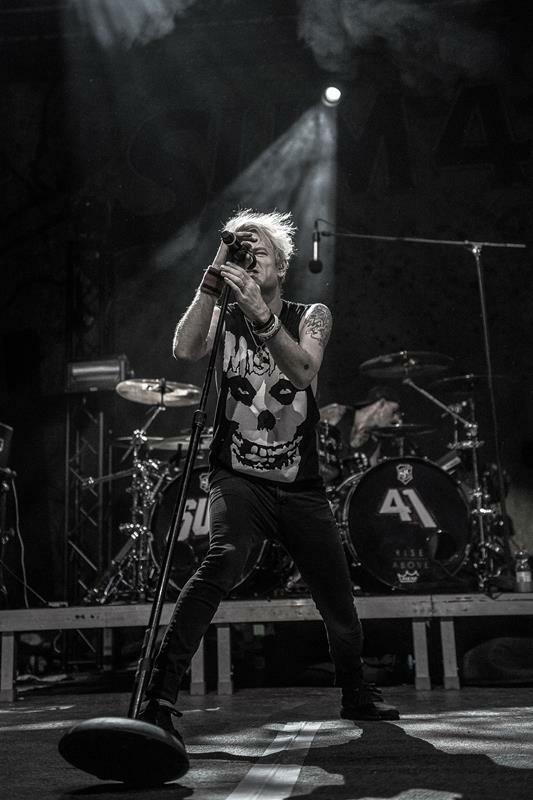 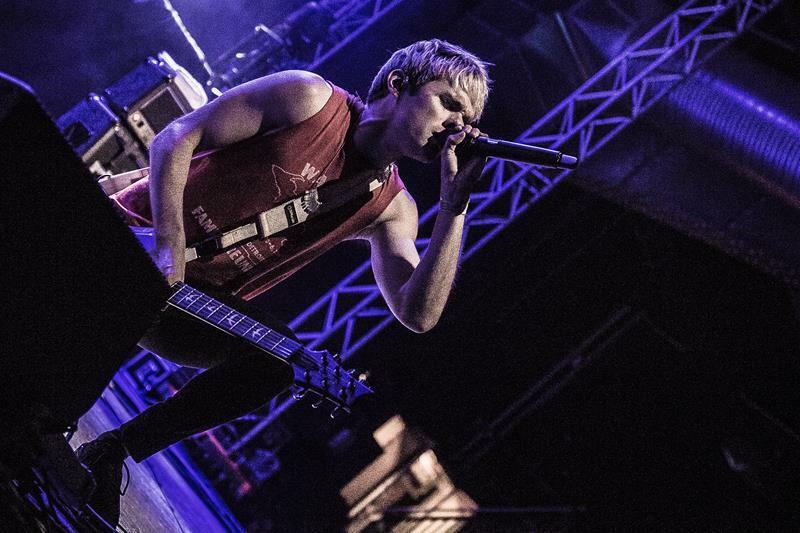 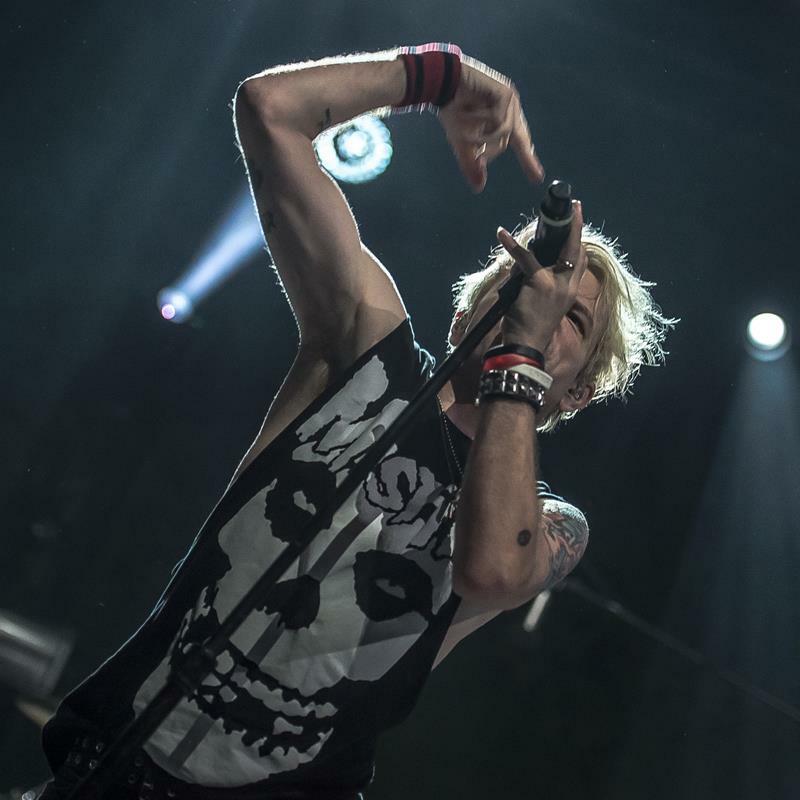 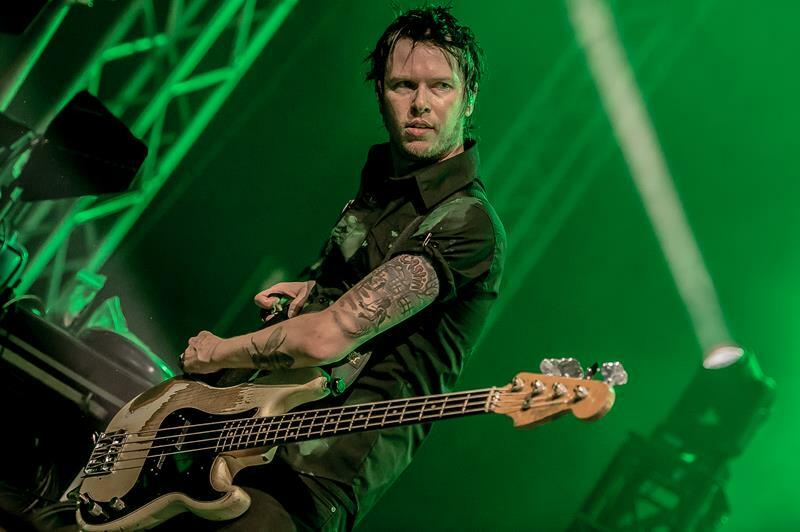 Amsterdam’ Singer Deryck stated that “it wouldn’t be a SUM41 show if there was not some f*cking Metal in it”, and the band went on to play a few notes of BLACK SABBATH’s ‘Paranoid’ and ‘War Pigs’, which sent the crowd through the roof. 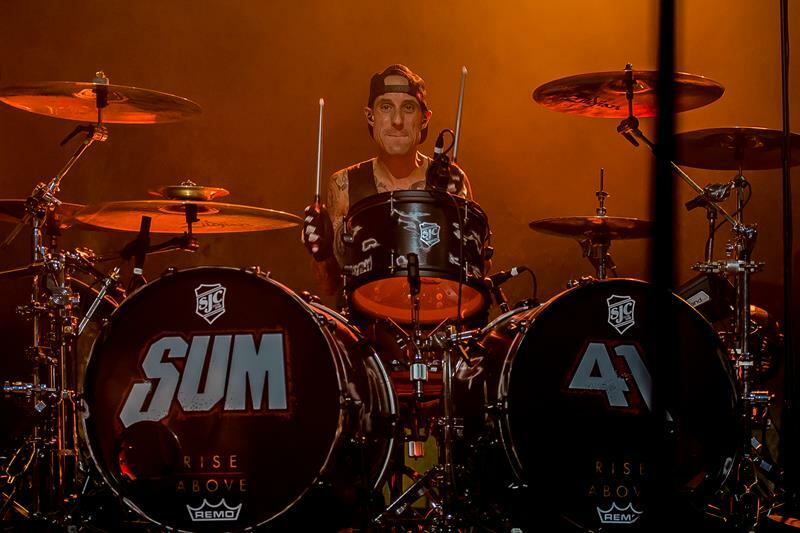 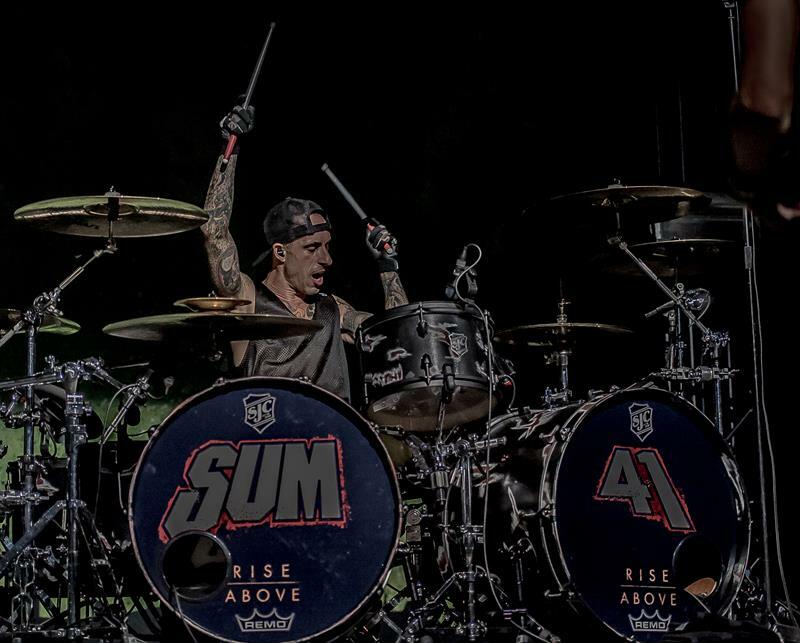 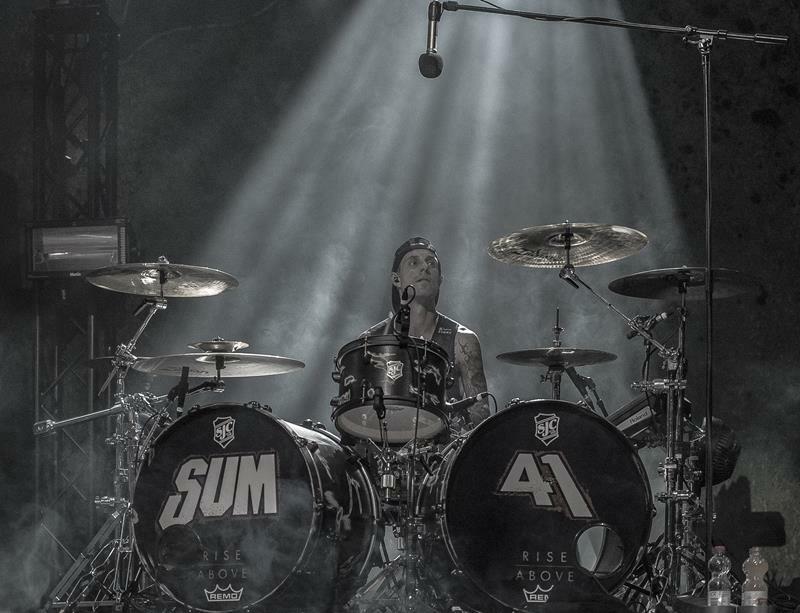 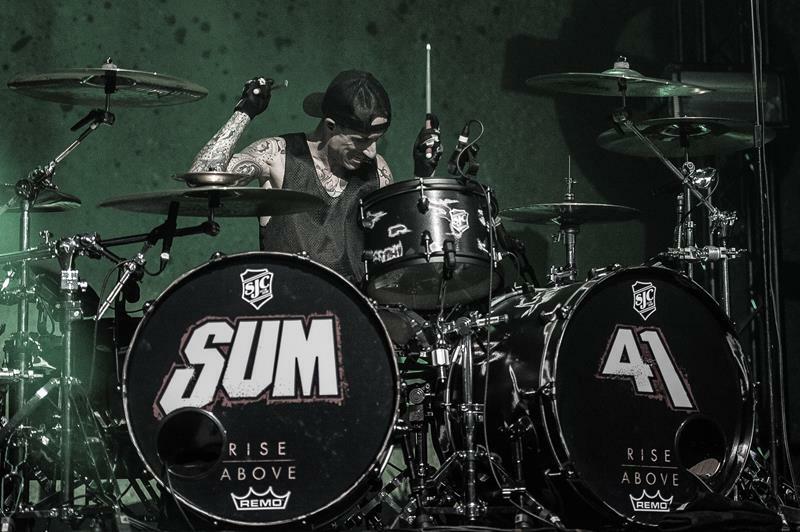 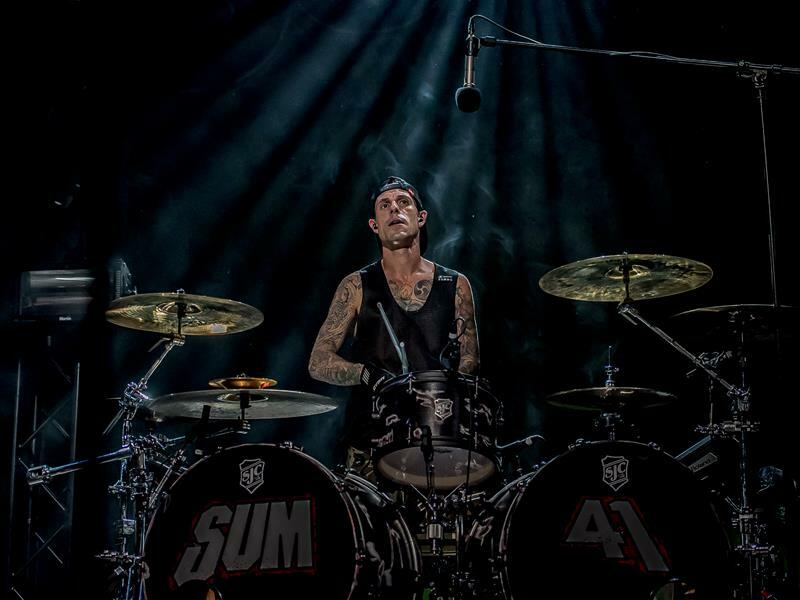 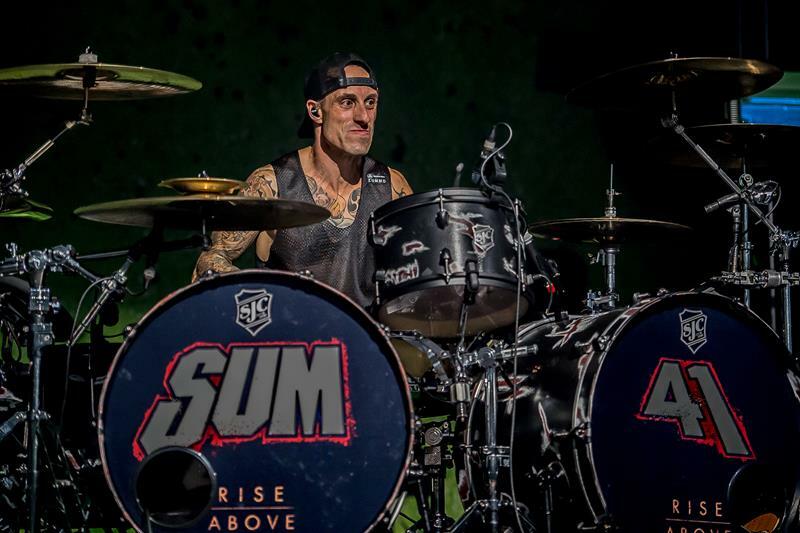 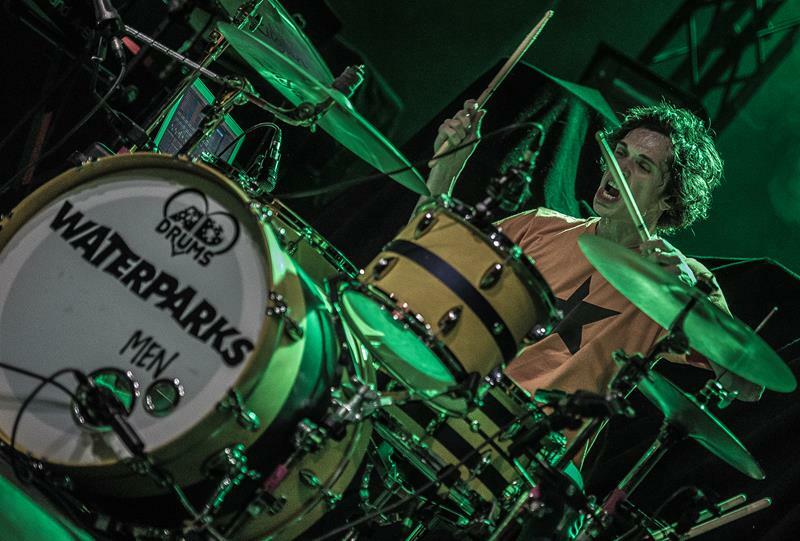 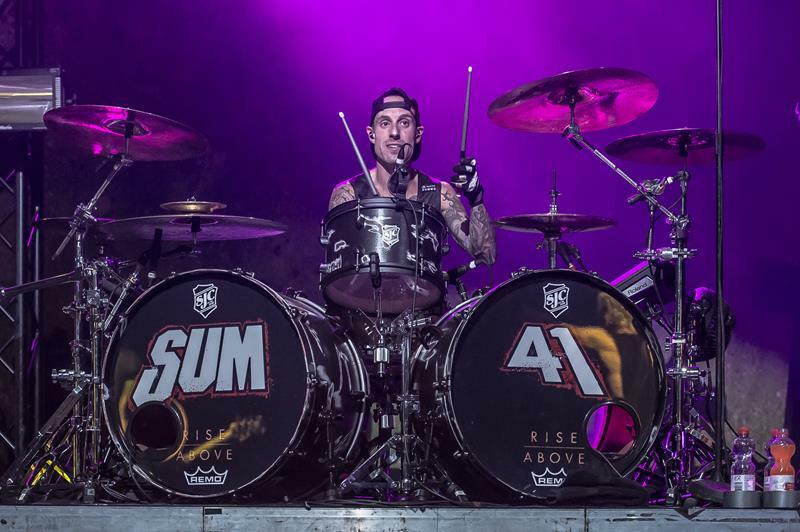 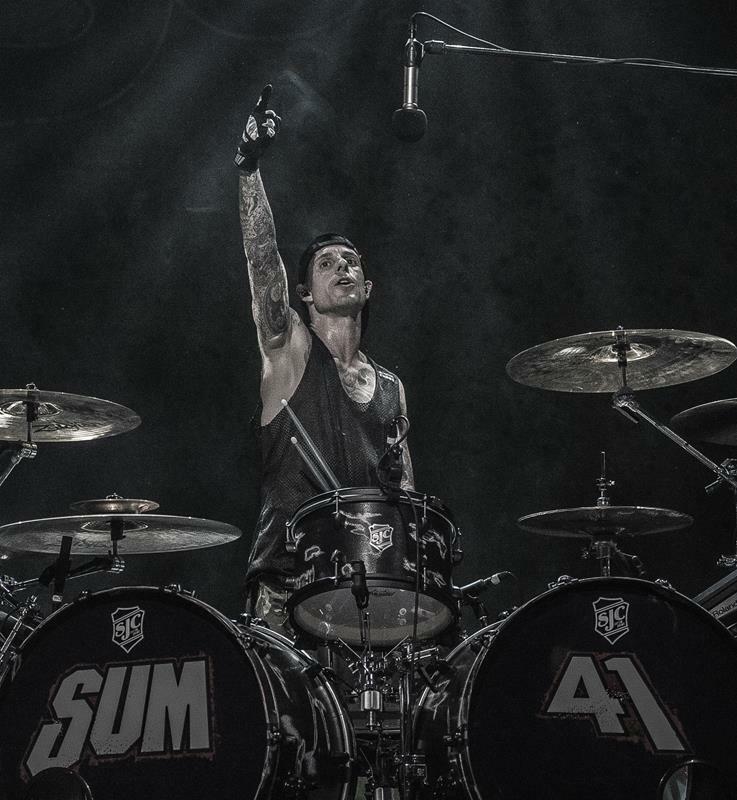 Drummer Frank Zummo had his time to shine about an hour into the set, when he played a remarkable drum solo, artfully teasing RAGE AGAINST THE MACHINE’s ‘Killing in the name’. 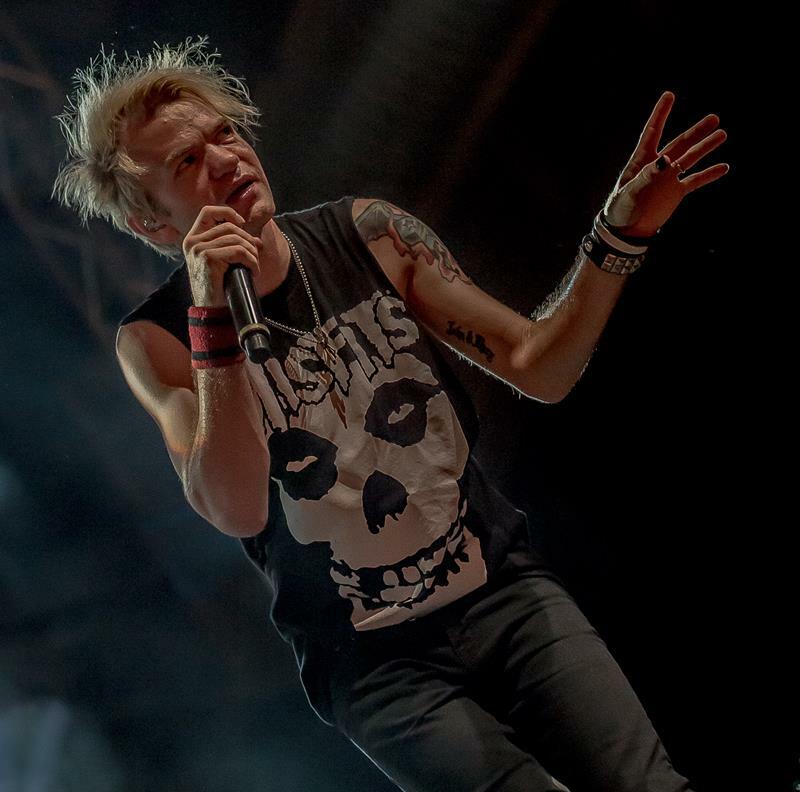 After ‘Fake My Own Death’, SUM41 went on to play their rendition of QUEEN’s ‘We Will Rock You’, and it worked perfectly. 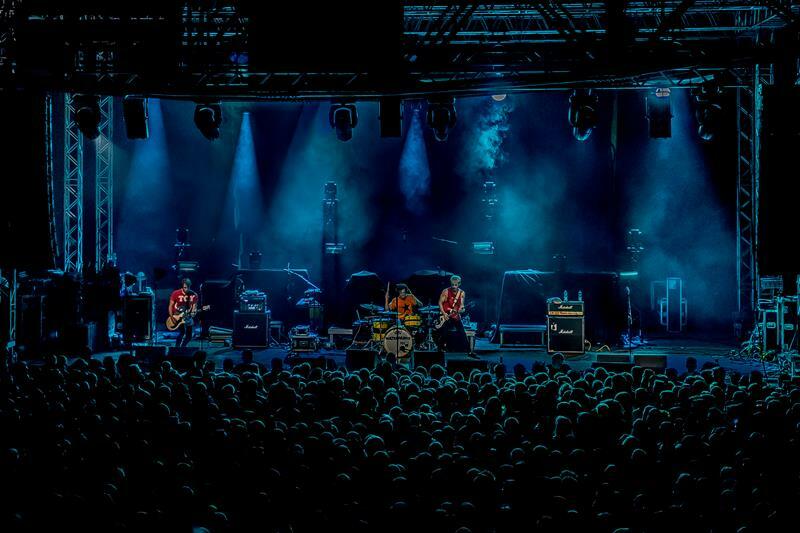 After 16 songs and a good 80 minutes of playtime the lights went out and the band left the stage. 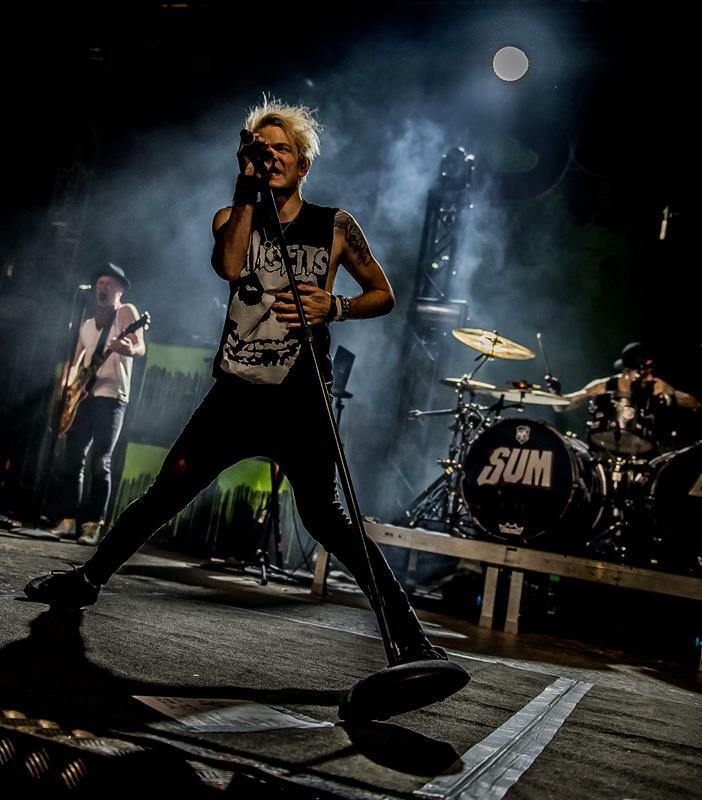 Fortunately, SUM41 were not done yet. 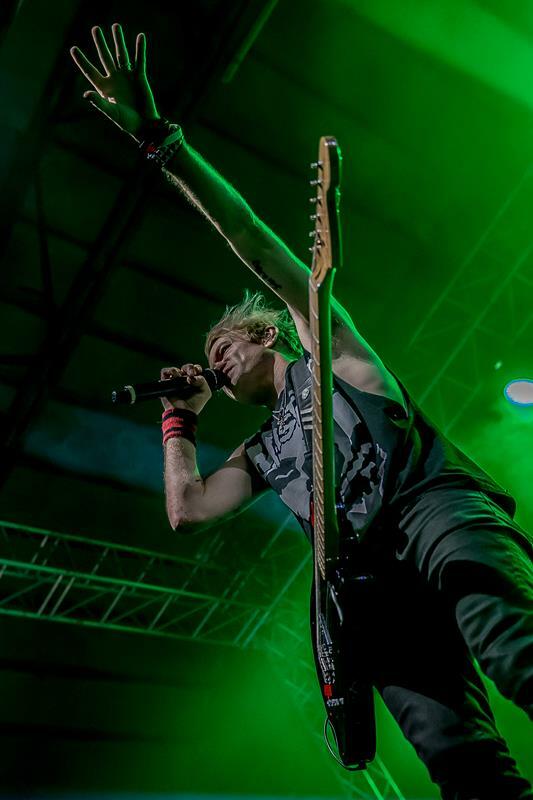 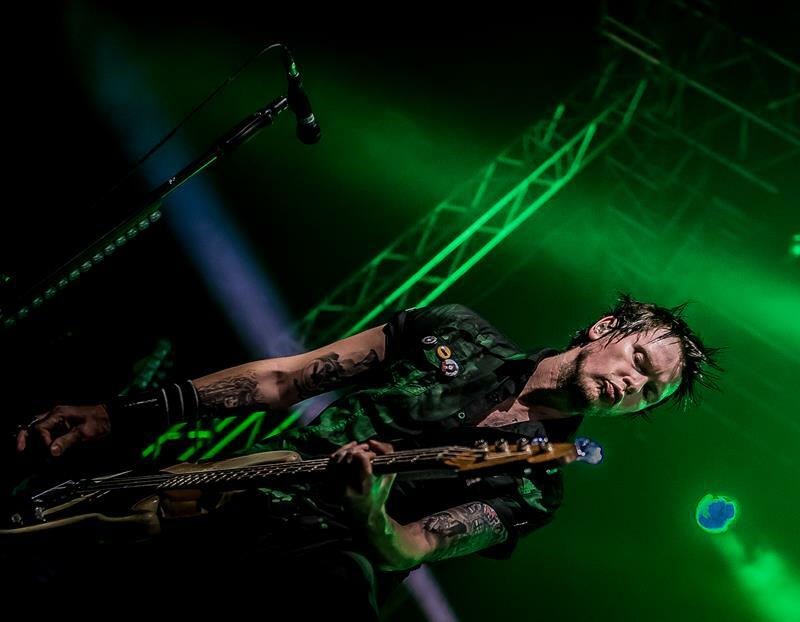 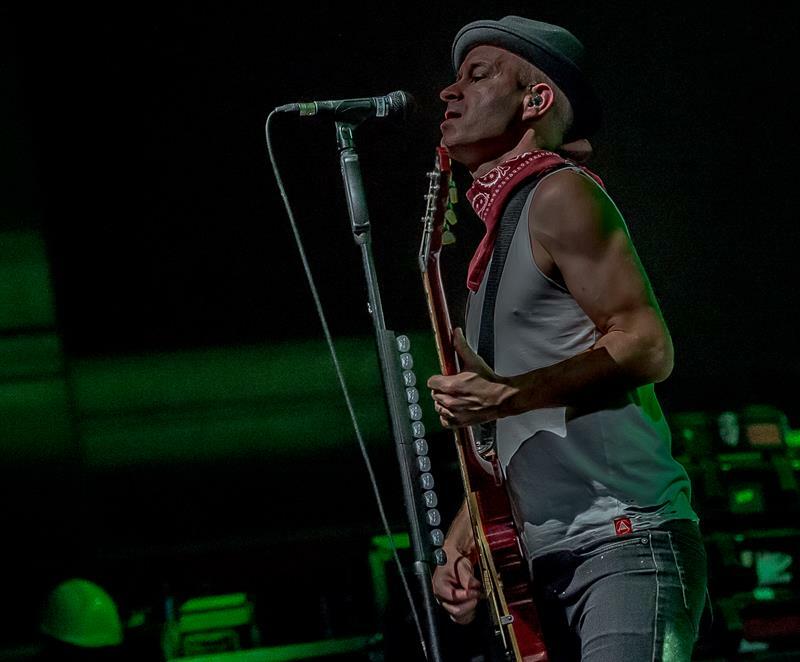 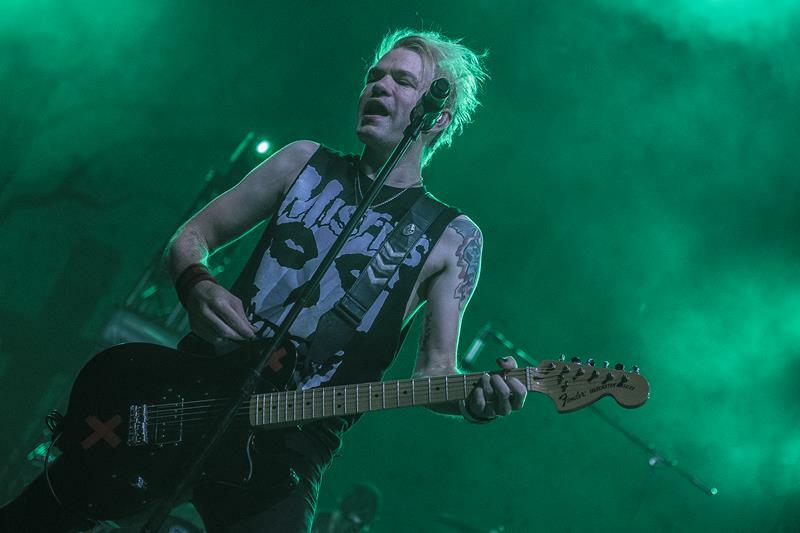 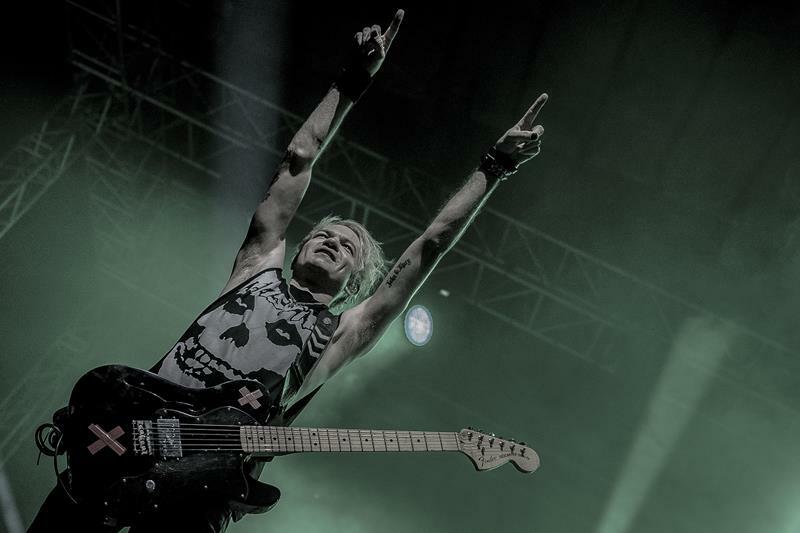 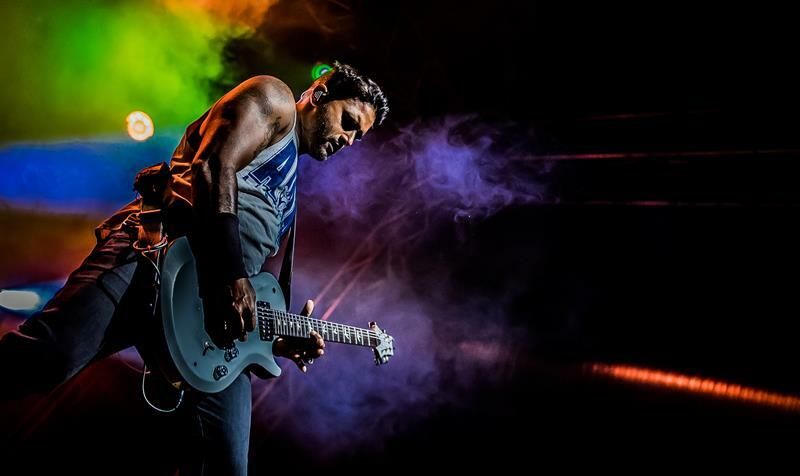 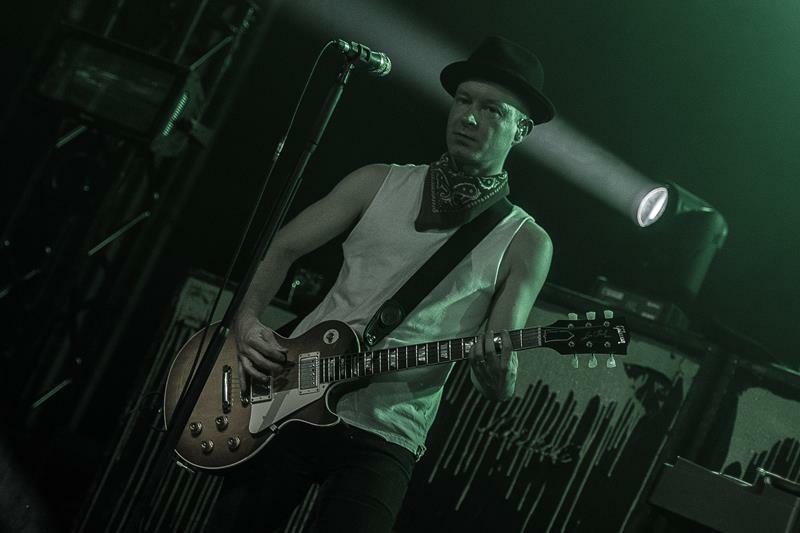 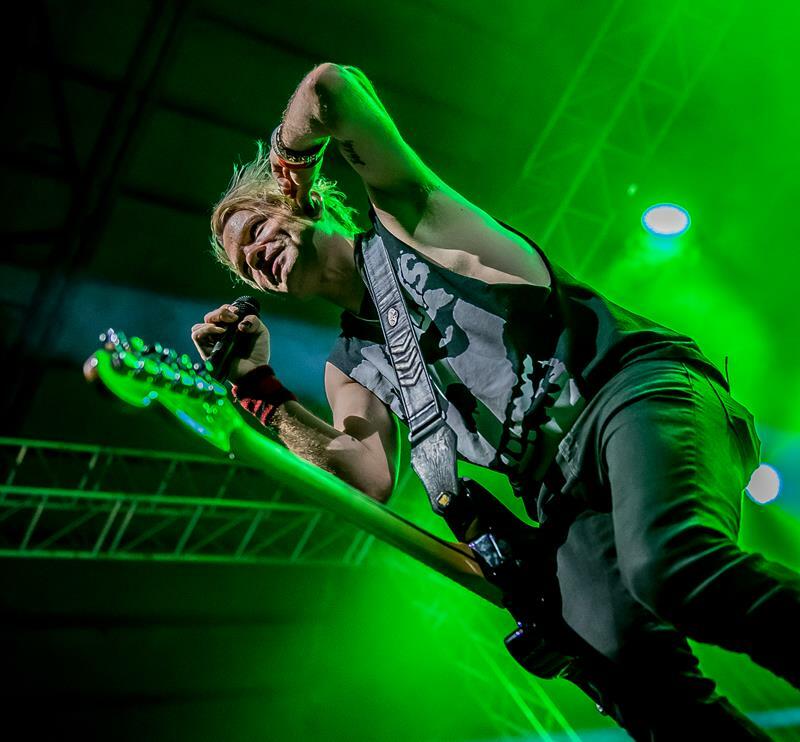 Steady screaming and clapping brought Deryck back onto the stage, where he jokingly performed the guitar riff of the first song every guitarist learns: ‘Smoke on the Water’ from DEEP PURPLE. 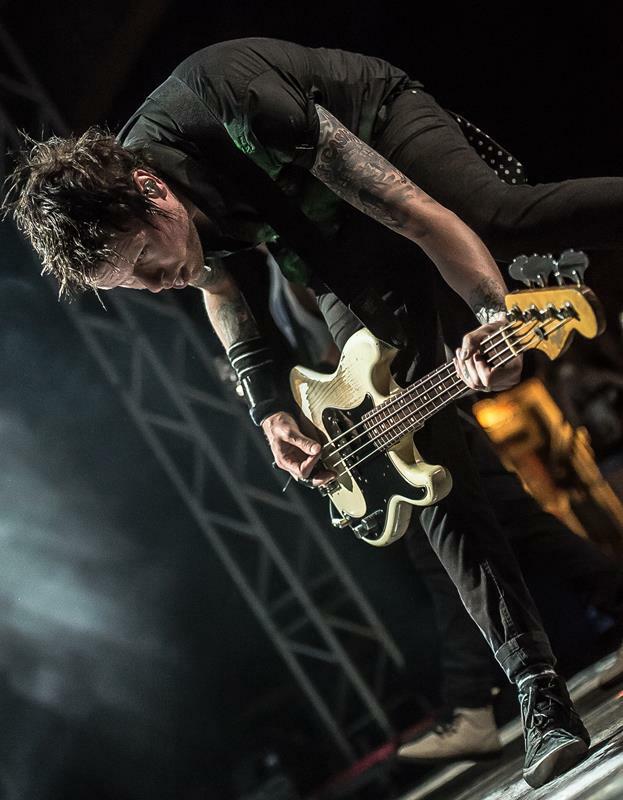 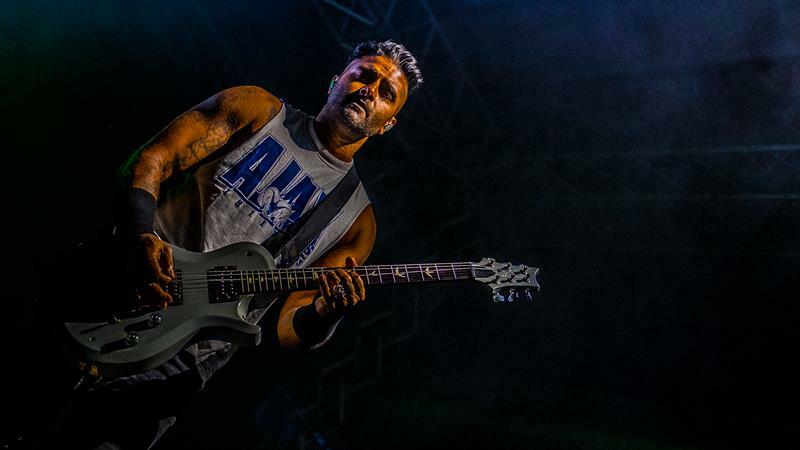 He then went on to show off his skills by playing the “f*cking best bass riff ever” (this would be ‘Seven Nation Army’ by THE WHITE STRIPES), which got everyone in the audience singing along, before changing over into ‘Pieces’. 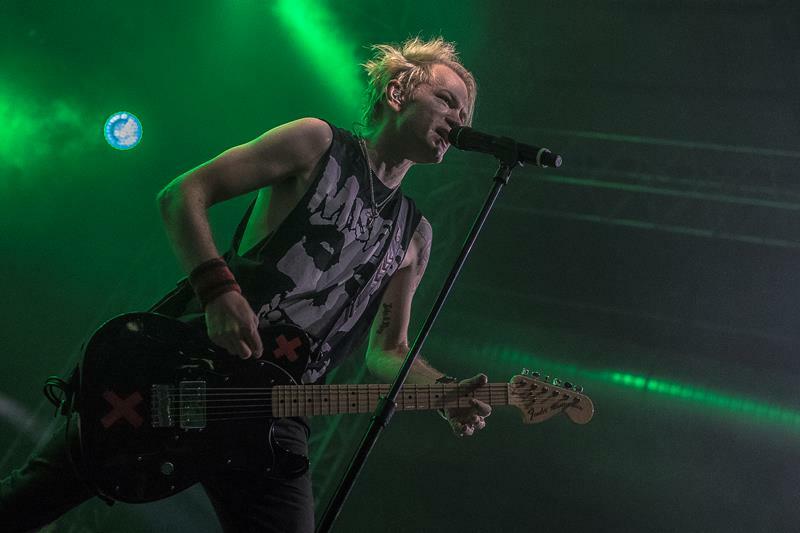 What followed was a nice encore with two more SUM41 songs, so around 10:45pm the show ended, and everyone could go and breathe in some fresh air of the warm summer night with their ears ringing.